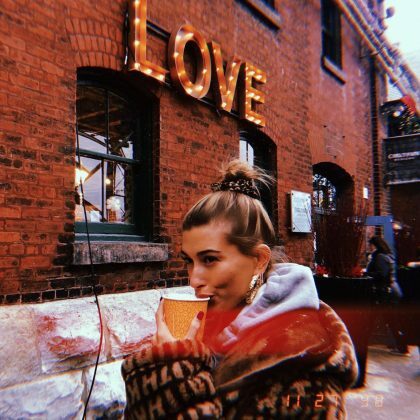 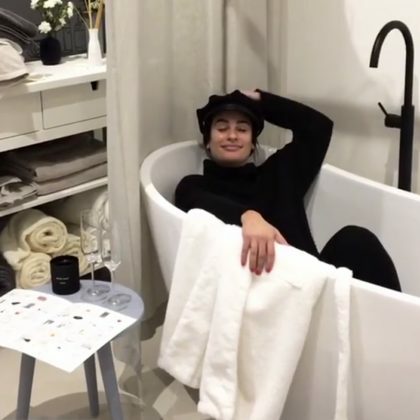 Hailey Baldwin said “yes to everything Christmas” when she had a hot beverage while hanging at Toronto, ON, Canada’s Toronto Christmas Market in November 2018. 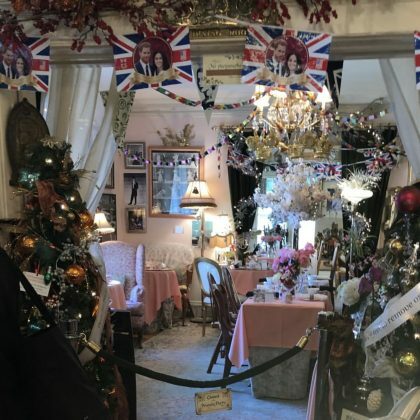 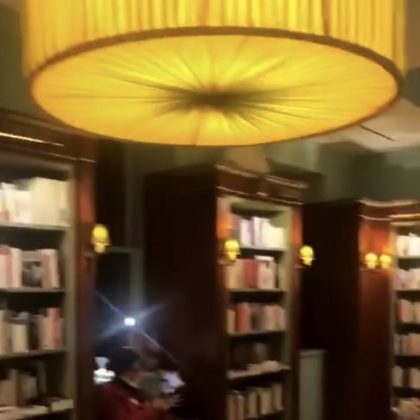 Jesse Tyler Ferguson checked into London, England, UK’s Fortnum & Mason, Piccadilly department store in November 2018. 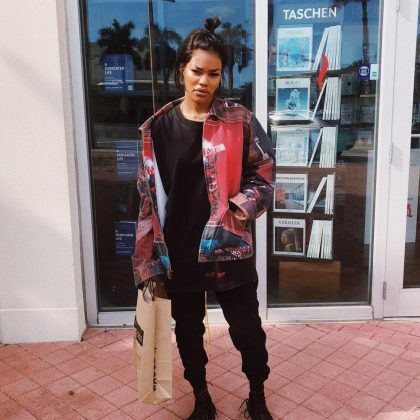 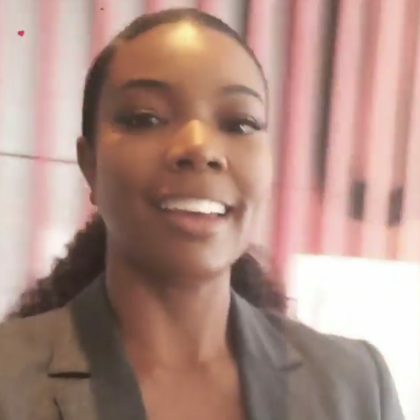 Teyana Taylor shopped at Miami, FL, USA’s Books & Books Bookstore at the Adrienne Arsht Center in November 2018. 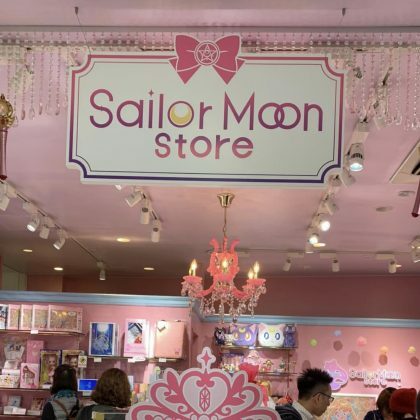 Joe Jonas checked out the Shibuya, Tokyo, Japan toy store when he was in Shibuya, Tokyo, Japan in November 2018. 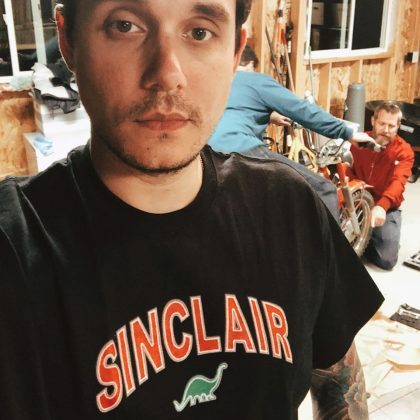 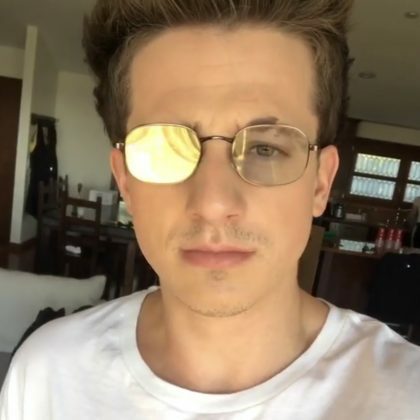 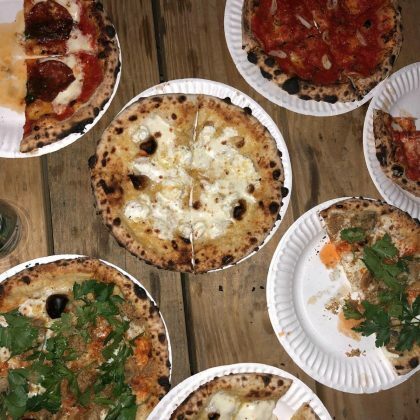 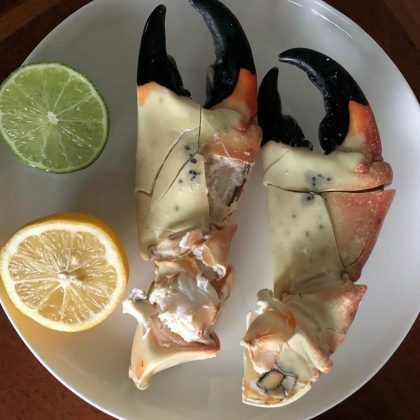 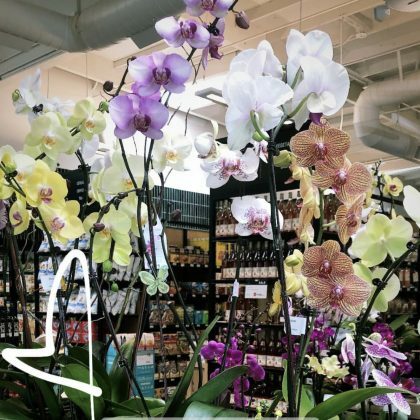 Jonathan Cheban checked out the offering at Homestead, FL, USA’s Robert Is Here Fruit Stand produce market in November 2018. 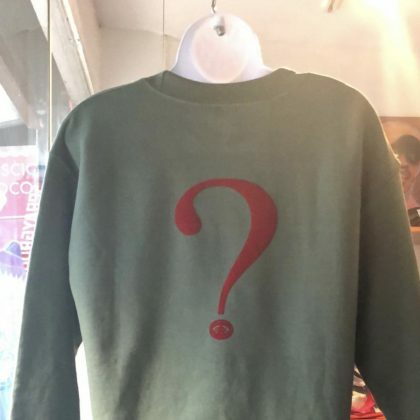 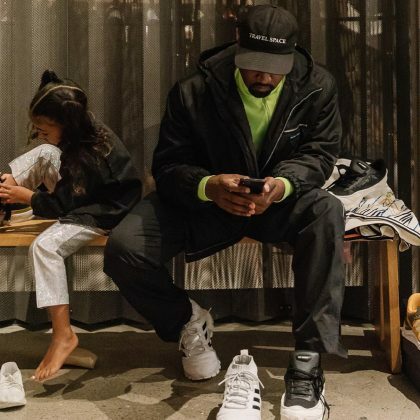 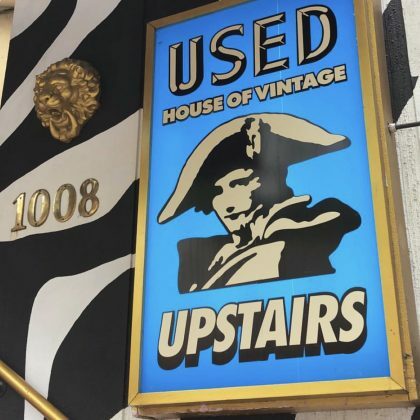 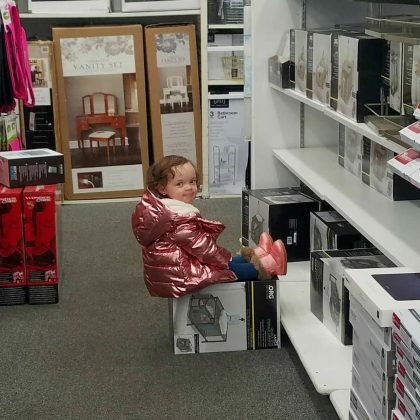 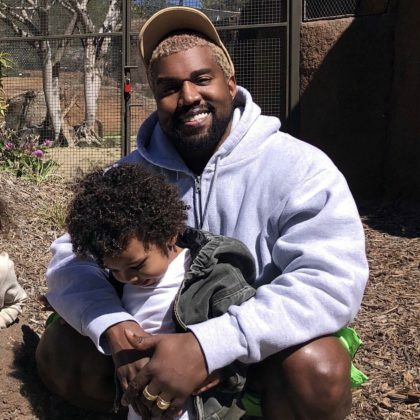 Kanye West and North West shopped at San Francisco, CA, USA’s Stashed clothing store in November 2018. 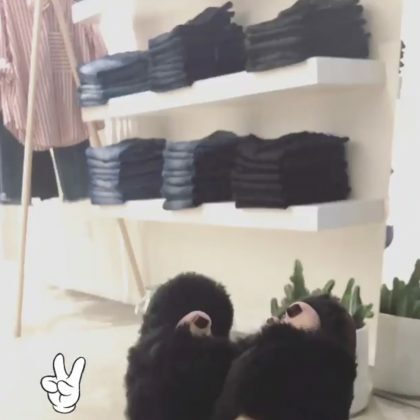 Lea Michele wore fuzzy slippers while shopping at Los Angeles, CA, USA’s AYR LA clothing store in November 2018. 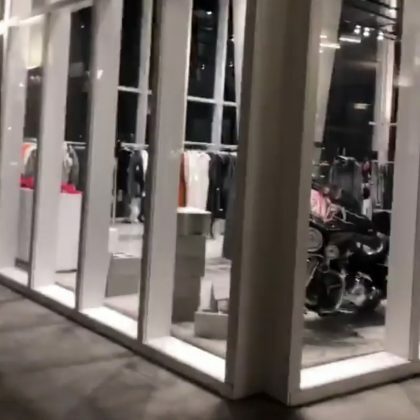 Shay Mitchell shopped at the adidas Store, Santa Monica in November 2018. 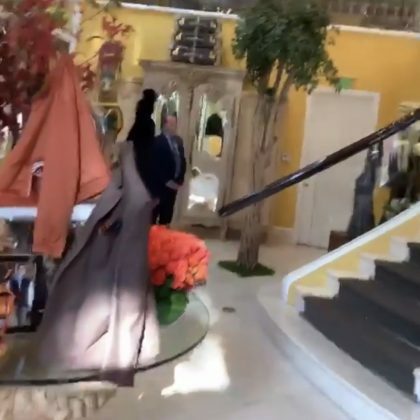 Jonathan Cheban popped into Beverly Hills, CA, USA’s House of Bijan clothing store in October 2018. 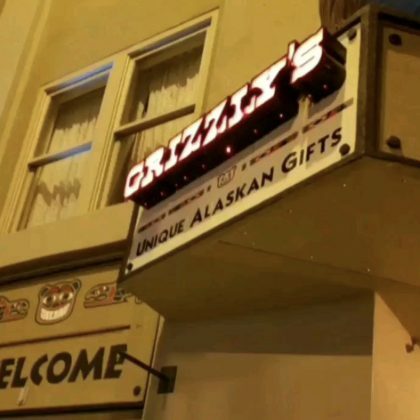 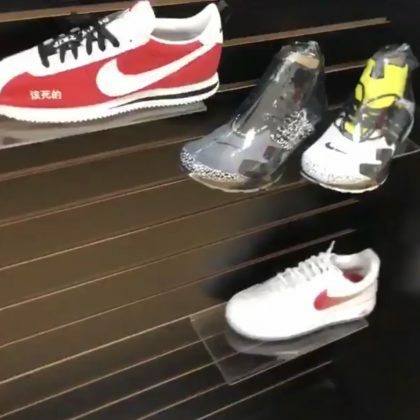 “RedwoodSF with the exclusives, yessir” is what Offset said when he shopped for sneakers at San Francisco, CA, USA’s RedwoodSF shoe store in October 2018. 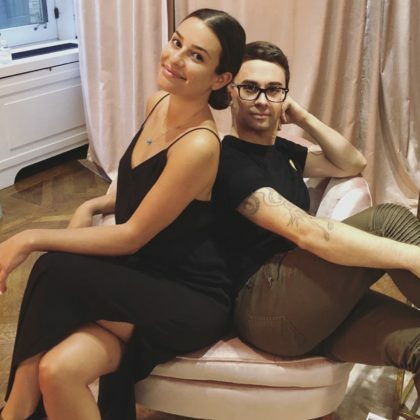 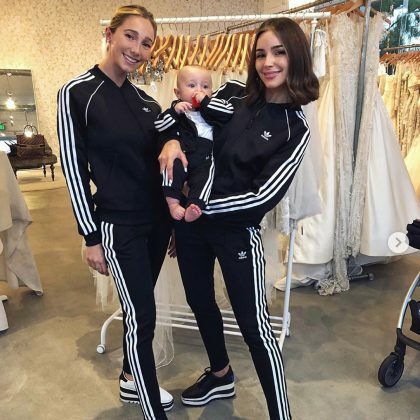 Olivia Culpo was “Picking out my sisters wedding dress” at Los Angeles, CA, USA’s Kinsley James Couture Bridal, West Hollywood in October 2018. 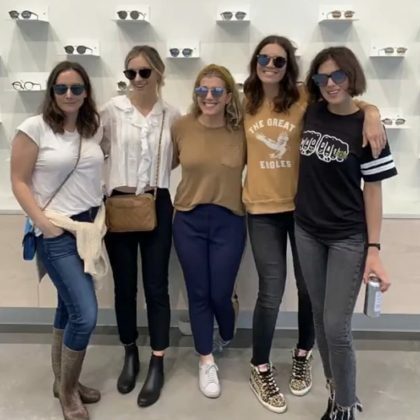 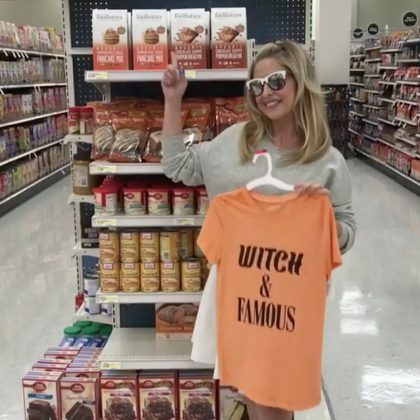 “It’s not a trip without a Shopportunity” is what Mandy Moore said when she and her friends shopped for “the greatest frames” at New Orleans, LA, USA’s Krewe sunglasses store in October 2018. 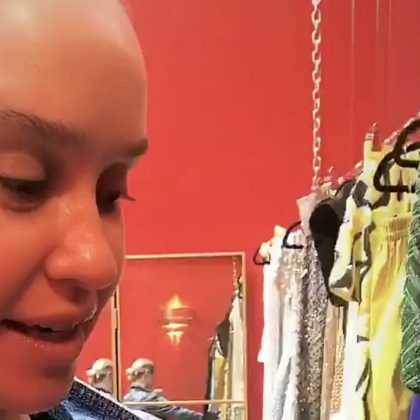 Juliette Lewis browsed the sweatshirts at New York City, NY, USA’s Sneak Ez clothing store in October 2018. 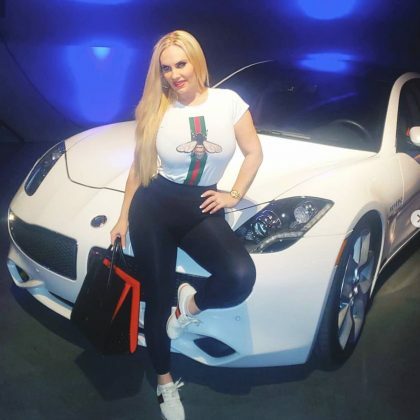 Coco was checked into New York City, NY, USA’s Classic Car Club Manhattan when she posted a pic next to her Karma Automotive car. 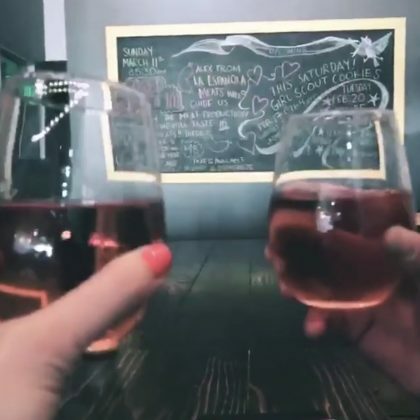 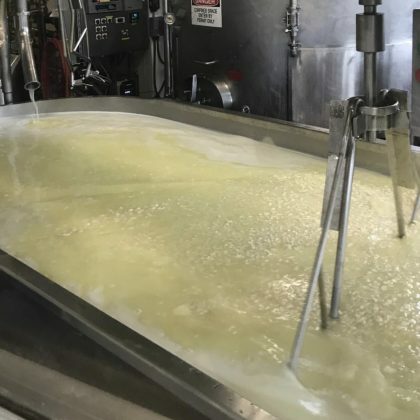 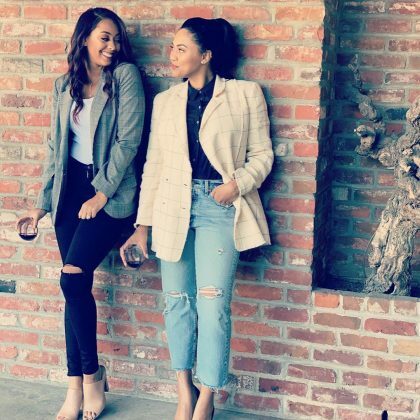 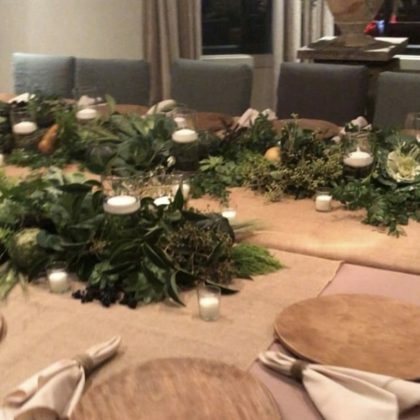 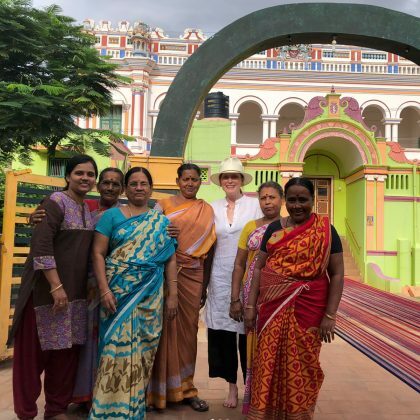 Ayesha Curry called herself and her sister-in-law “Female wine makers” when they went to San Jose, CA, USA’s Joseph George Wines for some Domaine Curry Wine in October 2018. 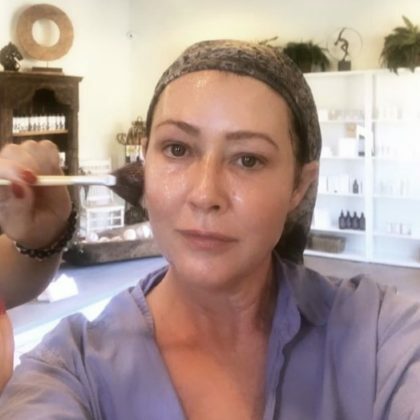 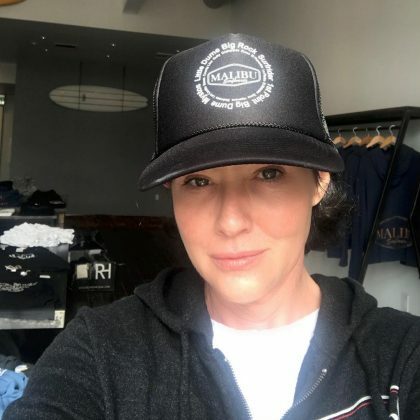 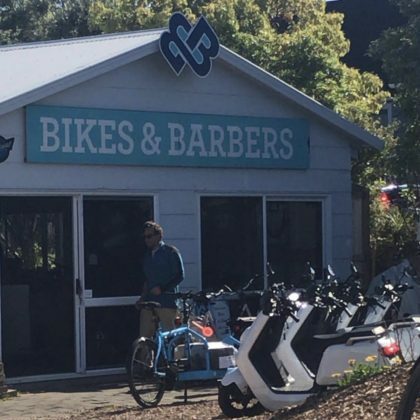 Shannen Doherty made a stop at Auckland, New Zealand’s Bikes & Barbers, Waiheke bike store in October 2018. 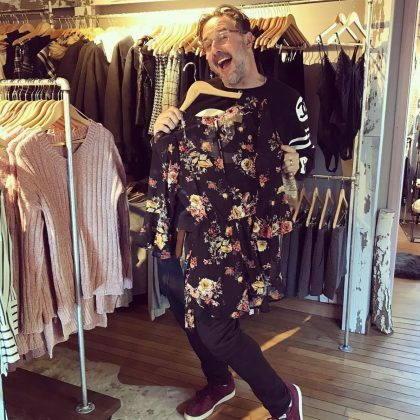 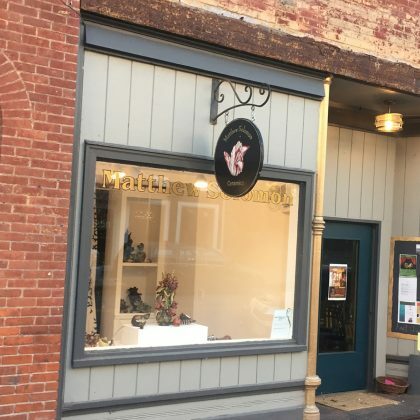 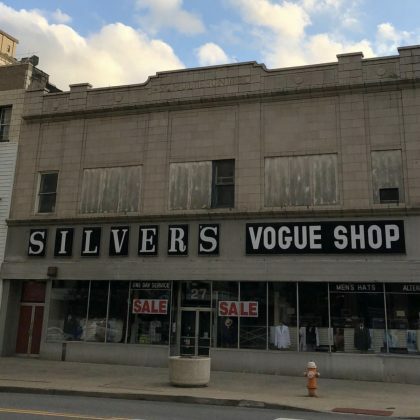 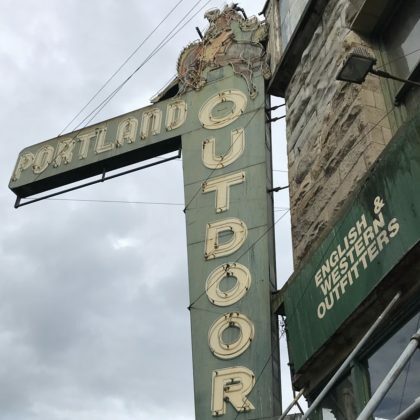 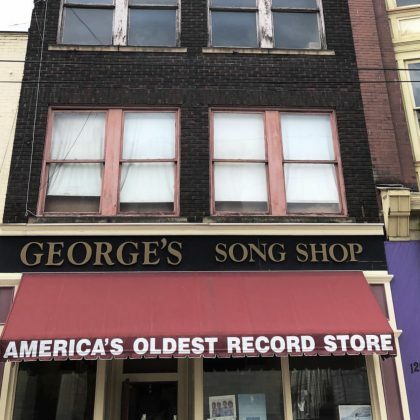 David Arquette was in front of Youngstown, OH, USA’s Silver’s Vogue Shop — a hat store — in October 2018. 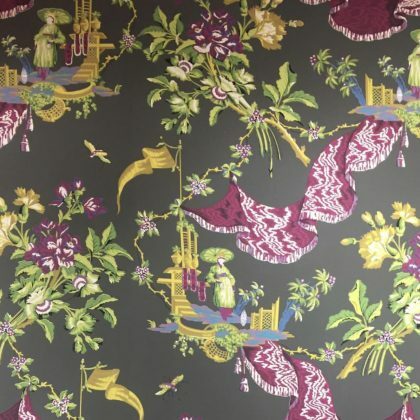 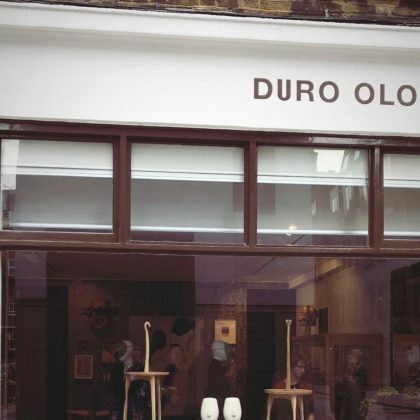 Maria Sharapova “Loved the decor” at London, England, UK’s Duro Olowu clothing store in October 2018. 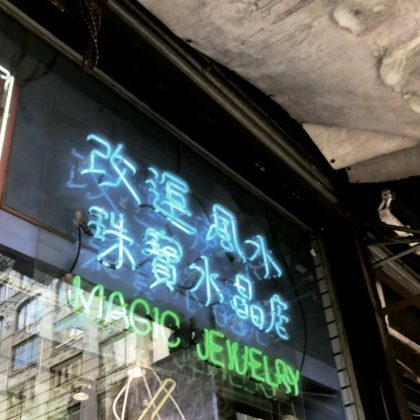 Gigi Hadid shopped for gems at New York City, NY, USA’s Astro Gallery of Gems in October 2018. 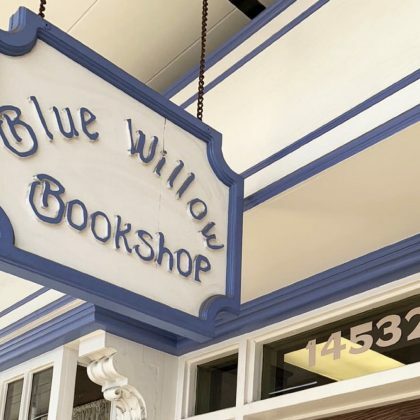 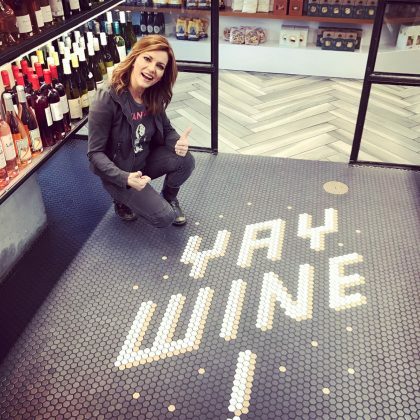 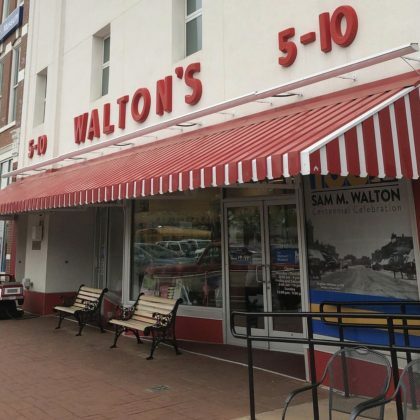 Tiffani Thiessen called Houston, TX, USA’s Blue Willow Bookshop “the cutest little bookshop” in October 2018. 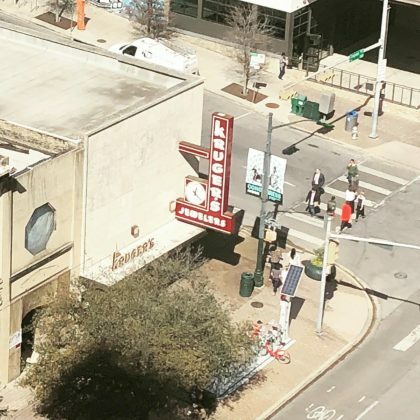 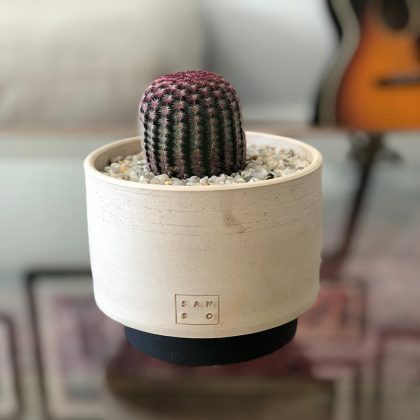 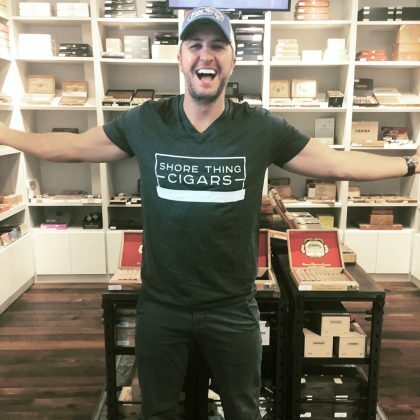 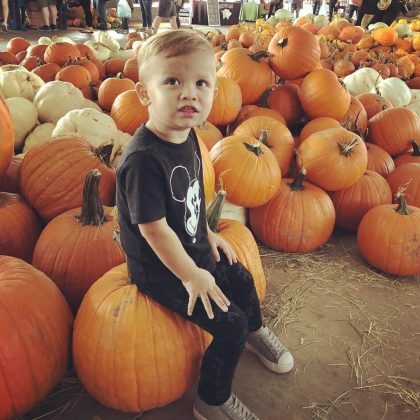 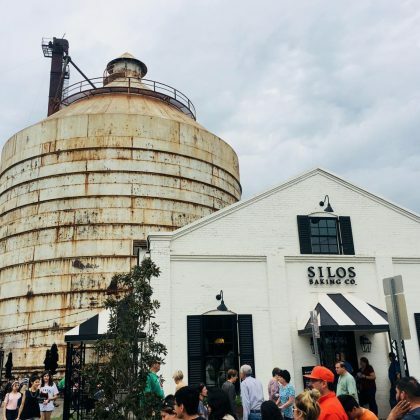 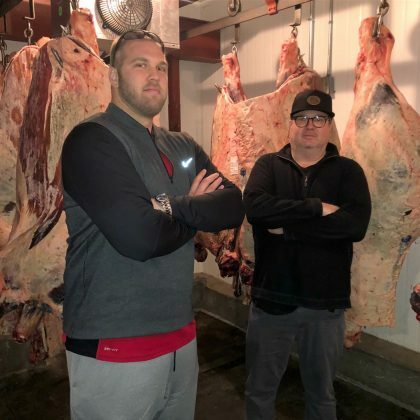 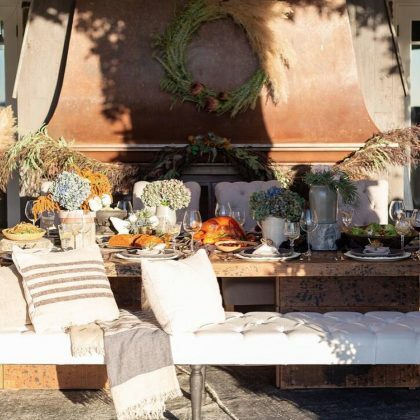 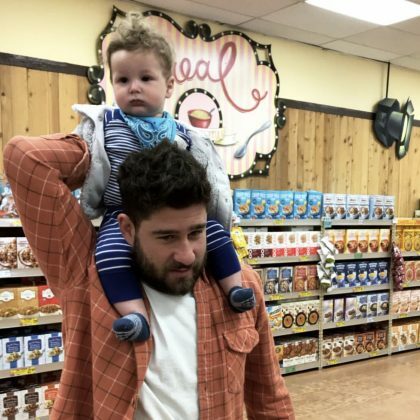 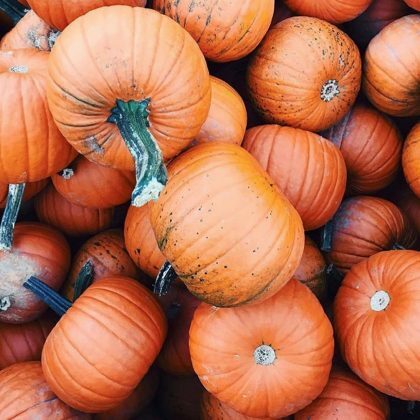 “And to think, just last year he ran headfirst into a pile of pumpkins” is what Catherine Giudici said when she and eldest son Samuel Lowe returned to the Dallas Farmers Market in September 2018. 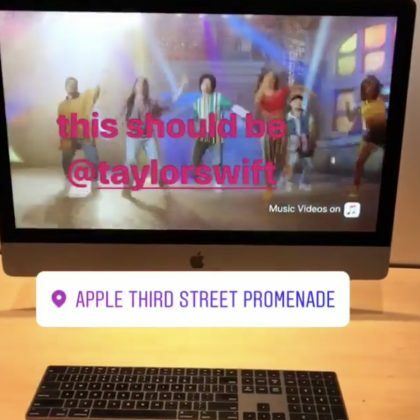 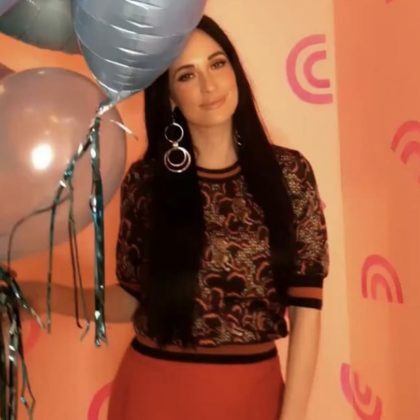 Kacey Musgraves was at Nashville, TN, USA’s Apple & Oak home goods store in September 2018. 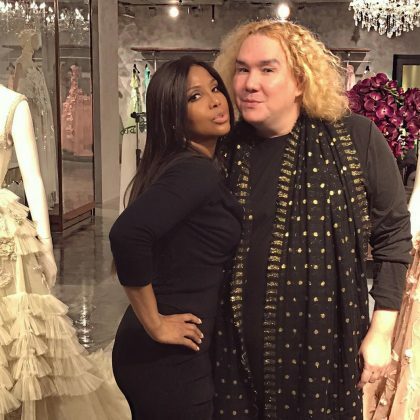 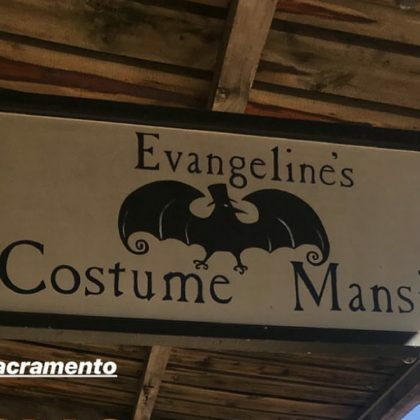 Bridget Marquardt was “Visiting my fav Halloweeen [sic] store” — Sacramento, CA, USA’s Evangeline’s Costume Mansion — in September 2018. 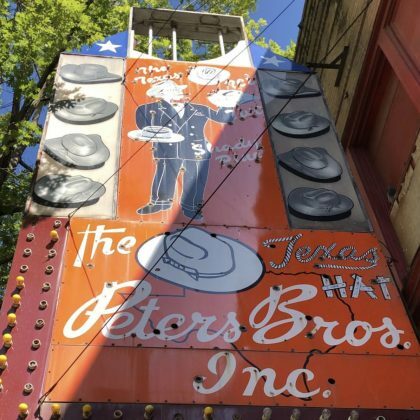 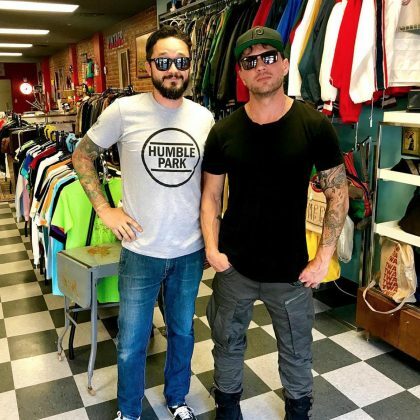 David Arquette stopped by Fort Worth, TX, USA’s Peter Brothers Hats in September 2018. 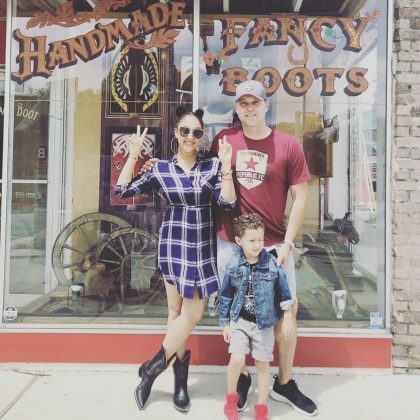 Janel Parrish shared in September 2018 that her “Rehearsal dinner dress” was from Toronto, ON, Canada’s OUTHERE by Marcus Chaves boutique. 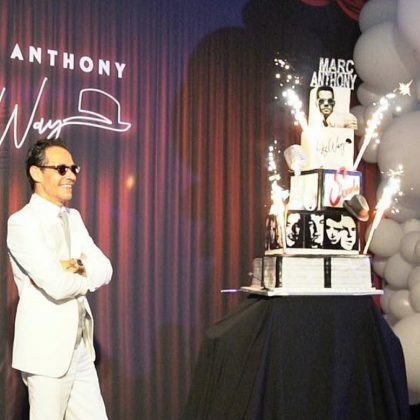 Miami, FL, USA’s Balloons by Luz Paz was behind the inflated decorations at Marc Anthony’s 50th birthday party in September 2018. 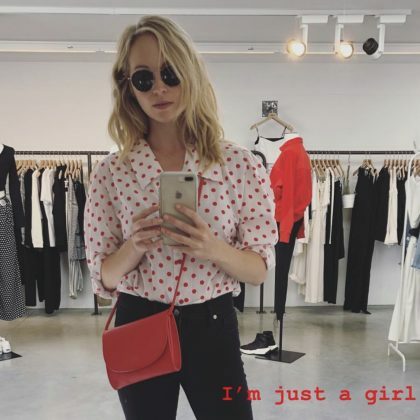 Becca Tobin browsed the racks at Los Angeles, CA, USA’s Entre Nous clothing and accessories store in March 2018. 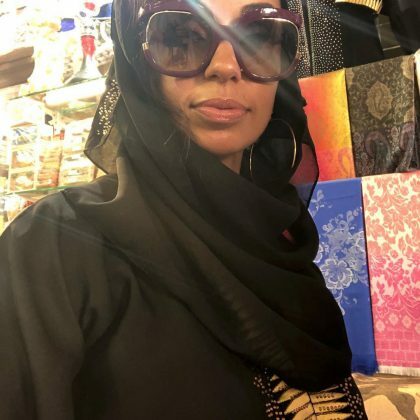 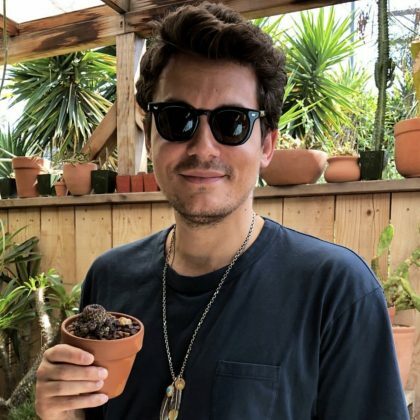 Mya went “Spice hunting” in September 2018 at Dubai, UAE’s Burjuman mall. 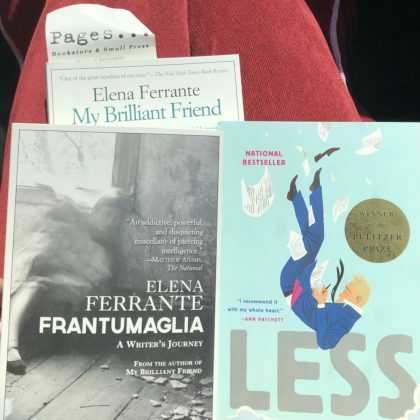 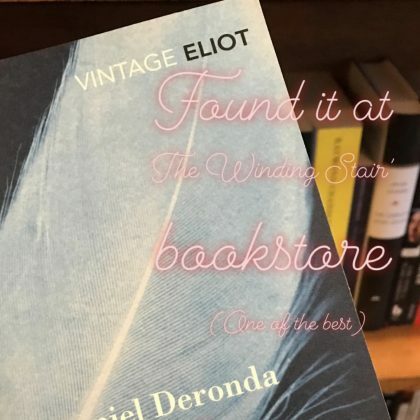 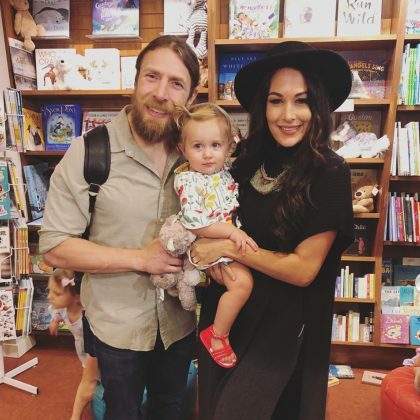 Brie Bella had “Such an amazing day” at La Jolla, CA, USA’s Warwick’s book store in September 2018. 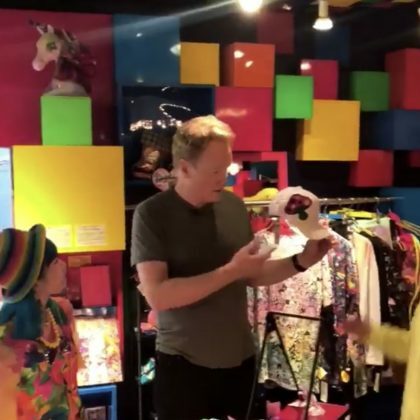 Conan O’Brien went shopping at Shibuya, Tokyo, Japan’s 6%DOKIDOKI clothing store in September 2018. 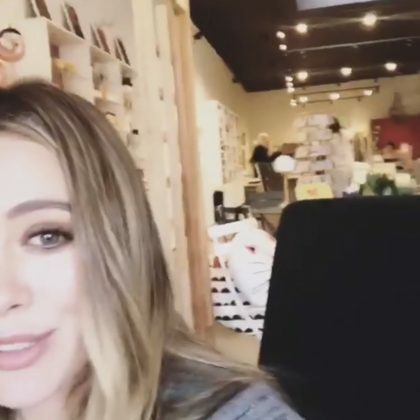 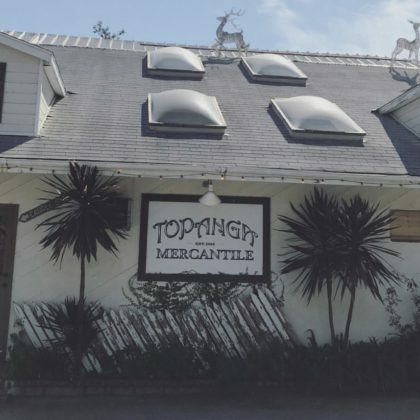 Haylie Duff stopped by Topanga, CA, USA’s Topanga Mercantile home goods store in August 2018. 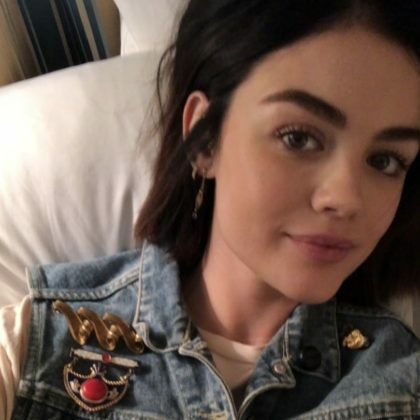 “I’ve always talked to imaginary things anyway” is what Lucy Hale said when she shopped at Seoul, South Korea’s Line Friends Flagship Store in August 2018. 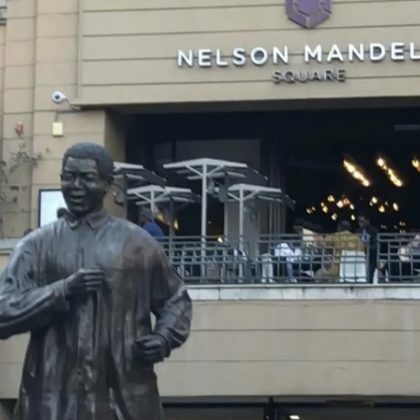 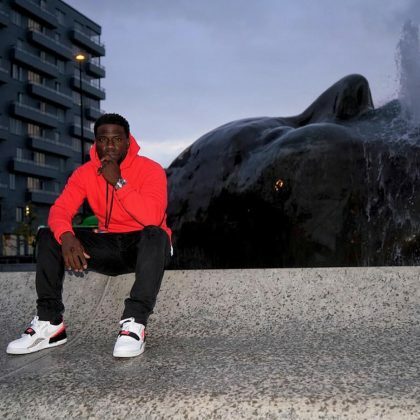 Kevin Hart took a seat by a statue outside Malmö, Sweden’s Emporia shopping mall in August 2018. 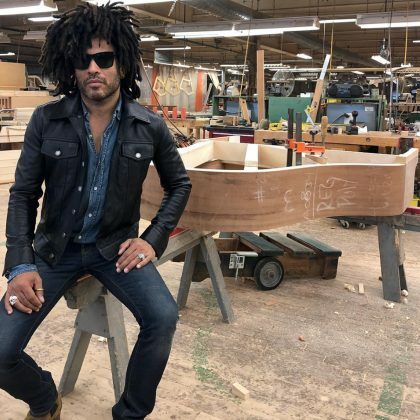 Lenny Kravitz perused the pianos at New York City, NY, USA’s Steinway & Sons Factory in August 2018. 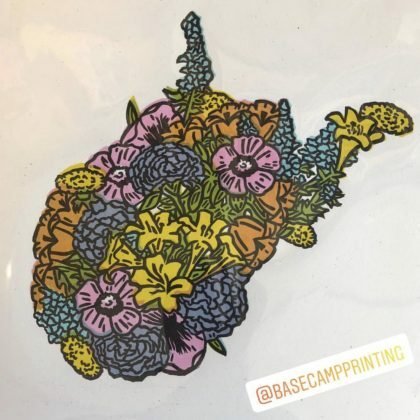 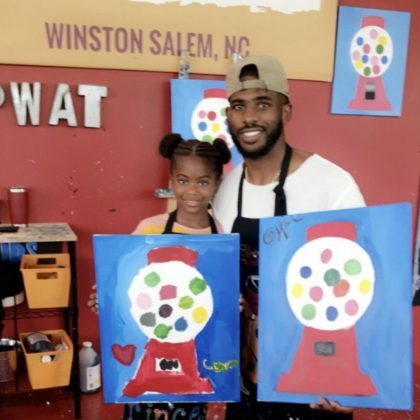 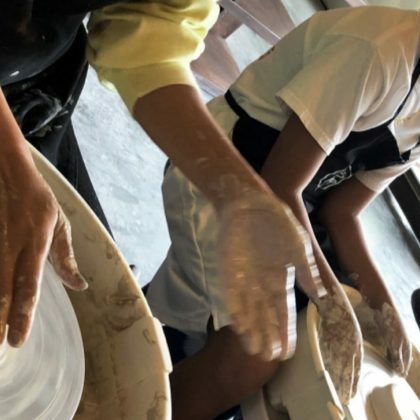 Chris Paul showed off his artwork when he and his family celebrated his daughter’s birthday at Painting with a Twist, Winston-Salem in August 2018. 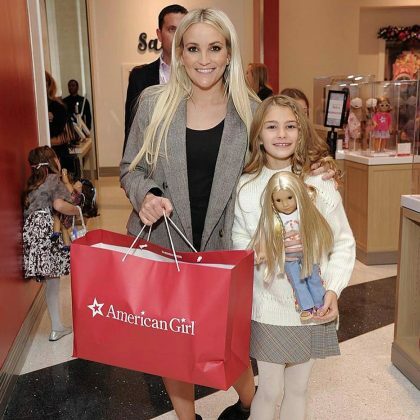 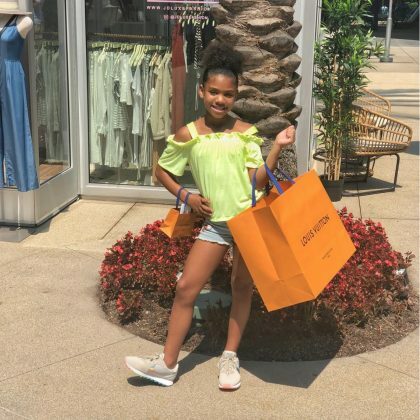 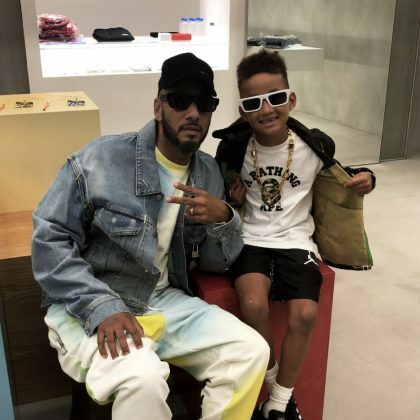 The Game did some “Back to school shoppin with my princess” in August 2018 at Santa Monica, CA, USA’s Louis Vuitton Santa Monica Place. 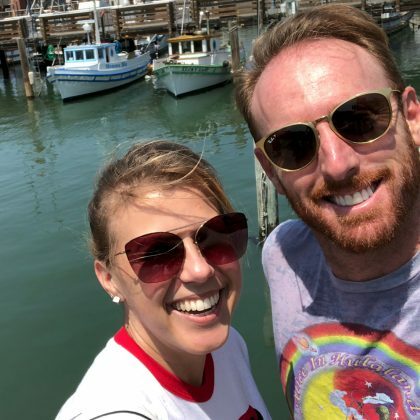 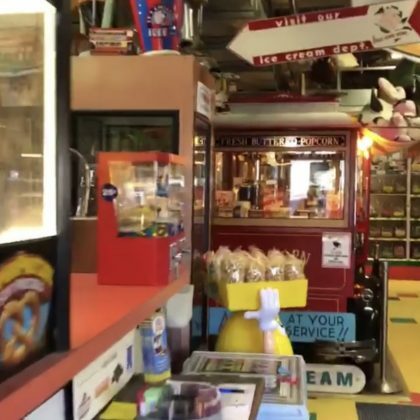 “Chocolate at Ghirardelli” from San Francisco, CA, USA’s Ghirardelli Square was how Jodie Sweetin topped off her touristy day in the city by the bay in August 2018. 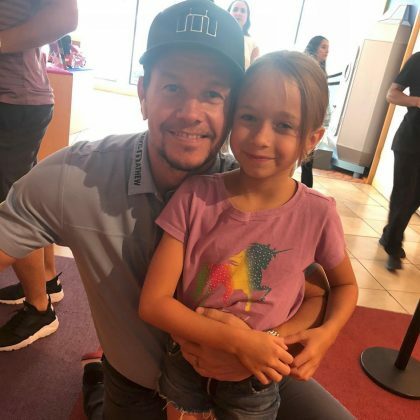 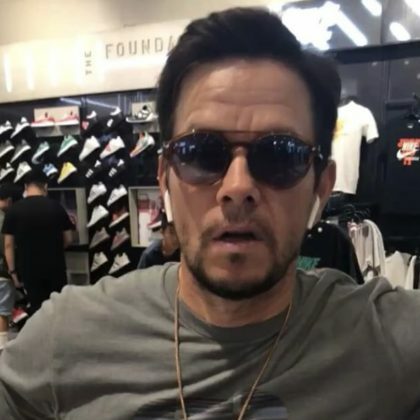 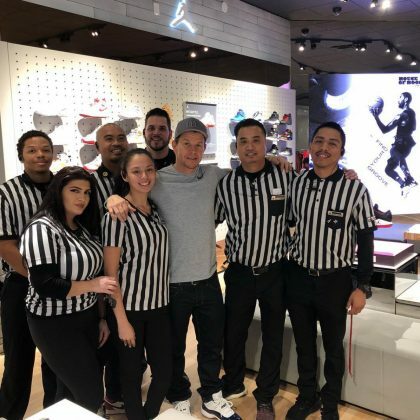 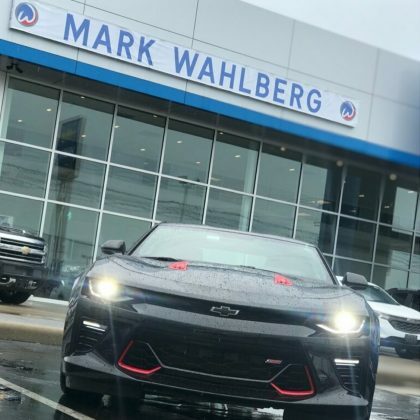 Mark Wahlberg shopped at Los Angeles, CA, USA’s Foot Locker, Beverly Center in August 2018. 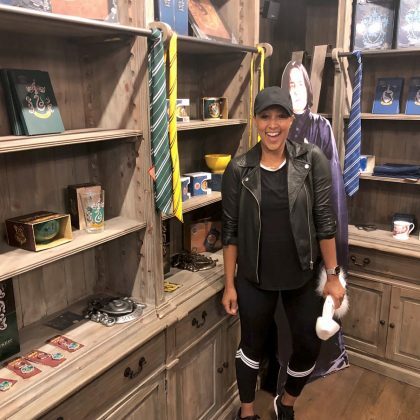 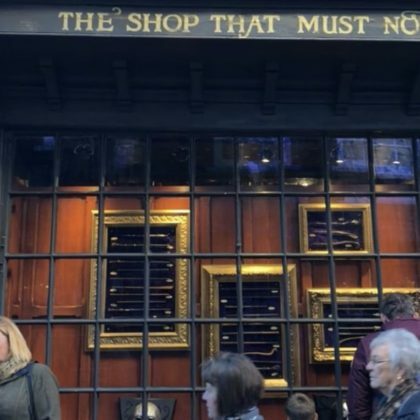 While in Edinburgh, Scotland, UK in August 2018, Tamera Mowry was excited she got “to go to an official Harry Potter store” — the popular Museum Context. 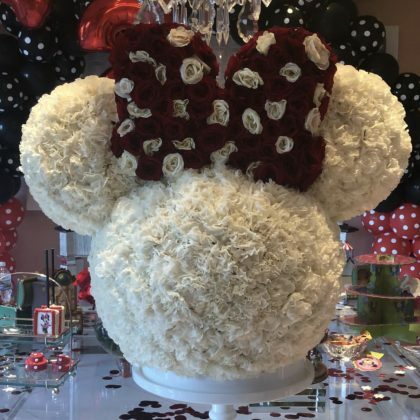 Nicky Hilton ordered Minnie Mouse-shaped flower arrangements from Costa Mesa, CA, USA’s Bloom Box florist for her daughter Lily Rothschild’s 2nd birthday party in August 2018. 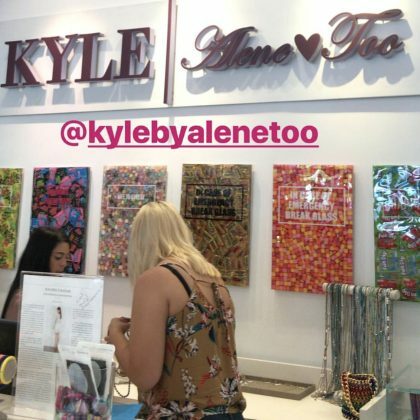 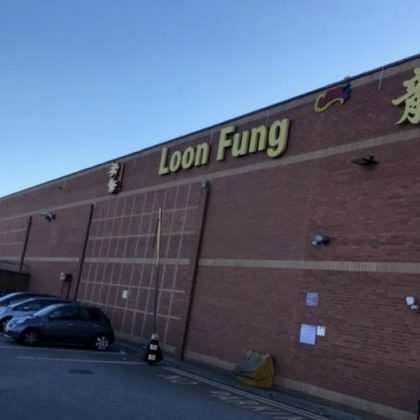 Danielle Fishel shopped at Los Angeles, CA, USA’s Chinatown Market in August 2018. 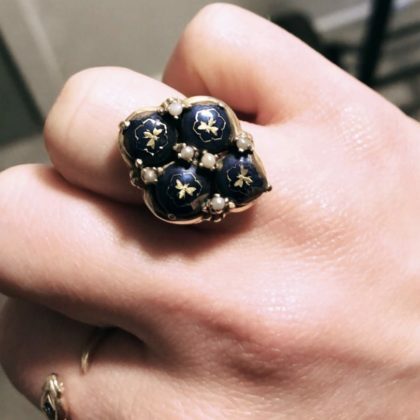 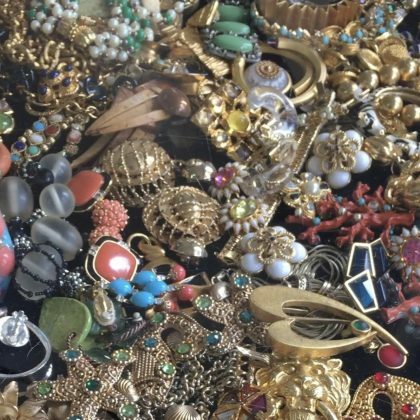 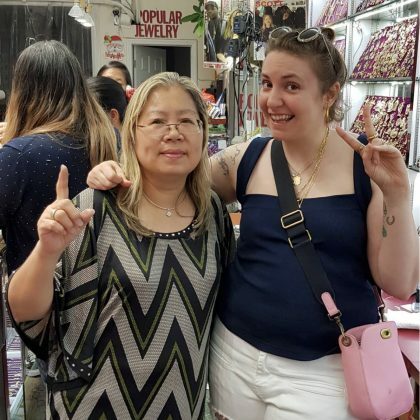 Lena Dunham said, “This is my favorite store,” when she shopped at New York City, NY, USA’s Popular Jewelry in July 2018. 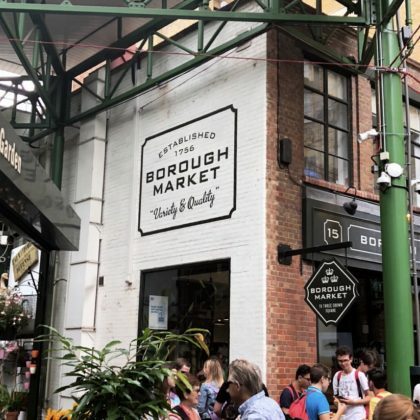 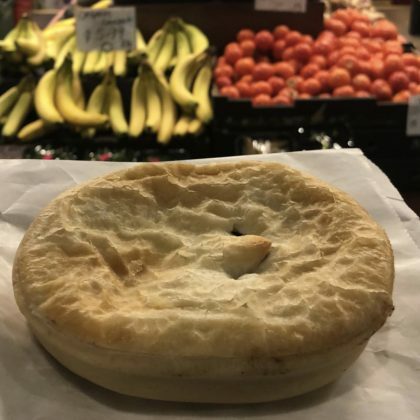 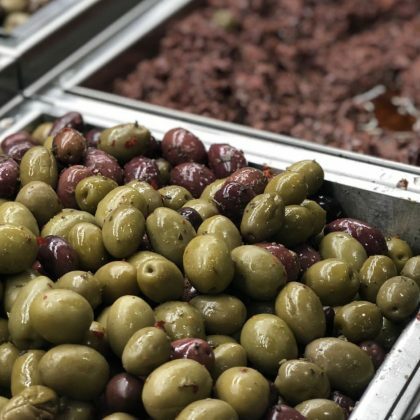 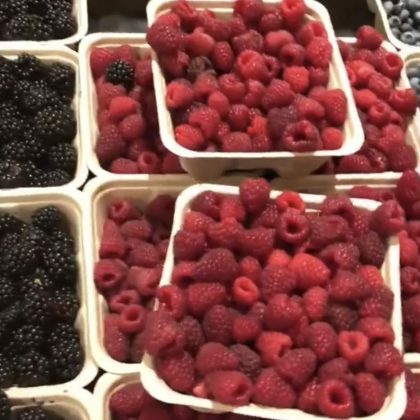 Katy Perry picked up some food at Adelaide, South Australia, Australia’s Adelaide Central Market in July 2018. 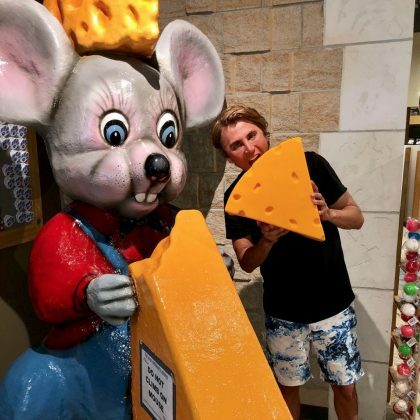 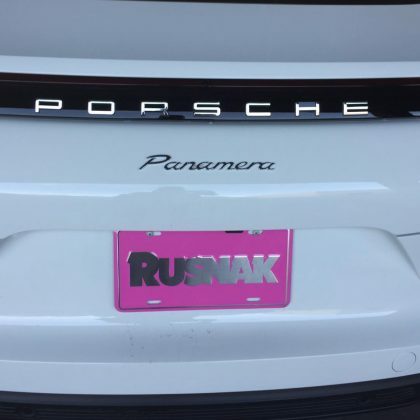 Jonathan Cheban had a meal while at Manhasset, NY, USA’s Americana Manhasset Shopping Center in July 2018. 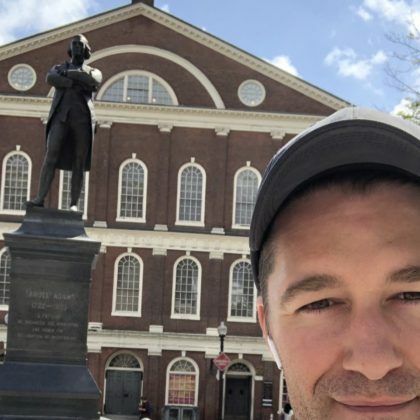 Matthew Morrison said he was “Having breakfast with samuel adams” at Boston, MA, USA’s Faneuil Hall Marketplace in July 2018. 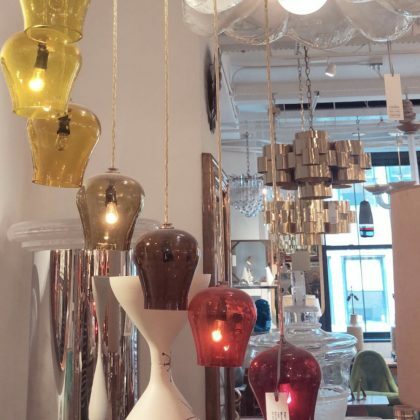 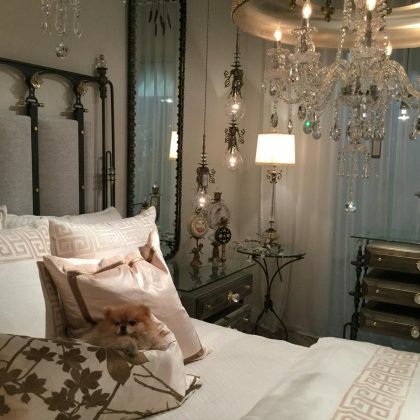 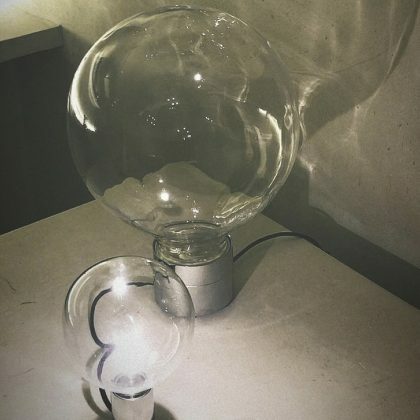 Nicky Hilton checked out the lighting options at New York City, NY, USA’s 1stdibs furniture store in July 2018. 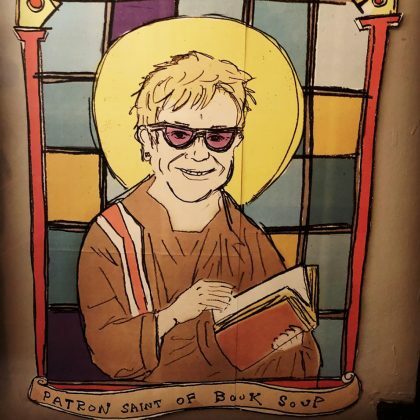 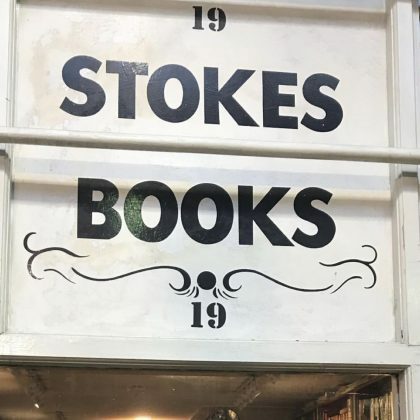 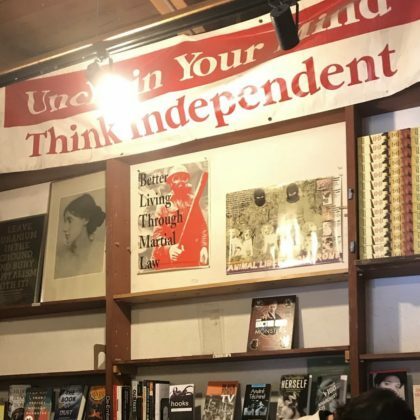 Alanis Morissette stepped inside Milan, Italy’s Libreria Bocca book store in July 2018. 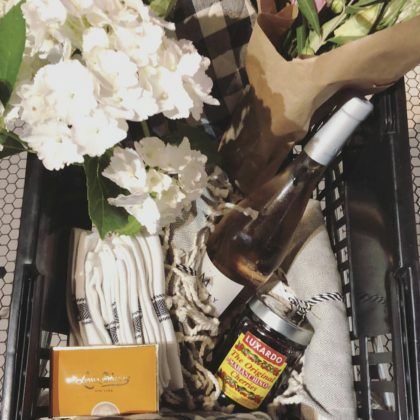 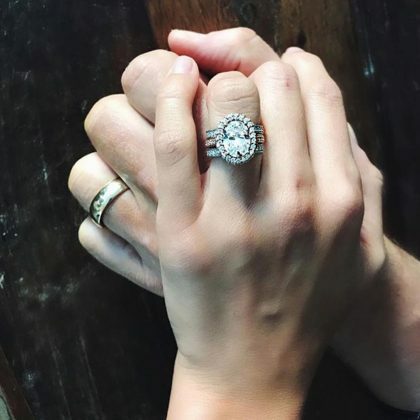 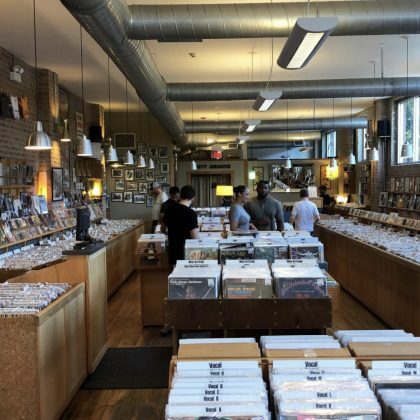 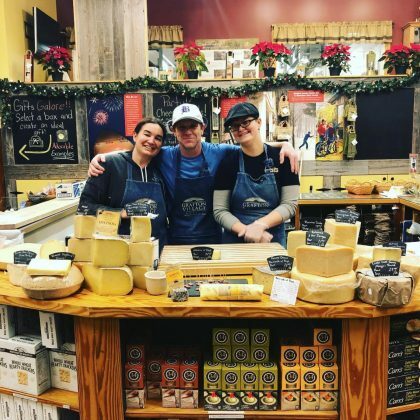 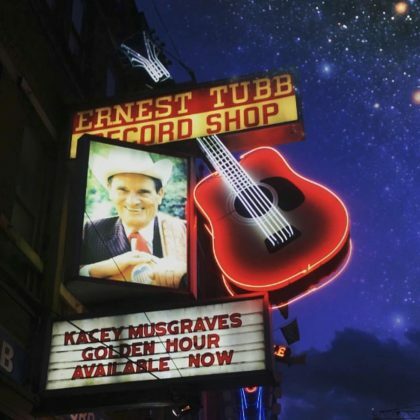 Kacey Musgraves filled her cart with “pleasantries” — including flowers and wine — when she shopped at Eugene, OR, USA’s 5th Street Public Market in July 2018. 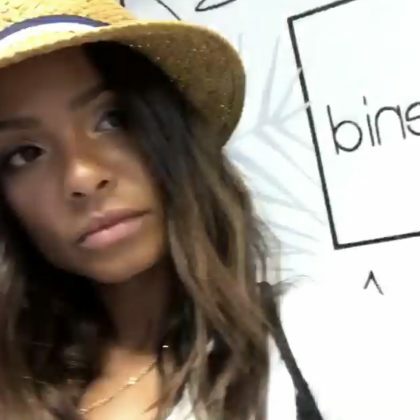 Christina Milian checked into alba.enid Old San Juan swimwear store in July 2018. 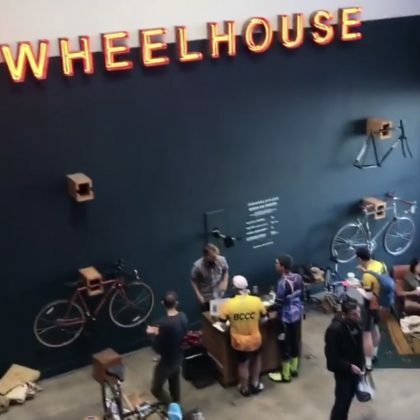 In July 2018, Beverley Mitchell said she was “loving my new wheels from” Boulder, CO, USA’s University Bicycles. 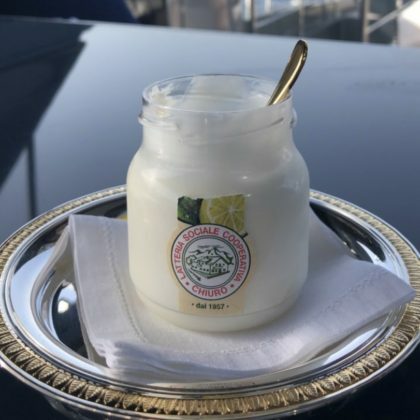 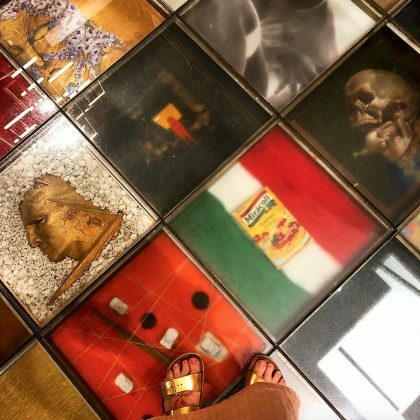 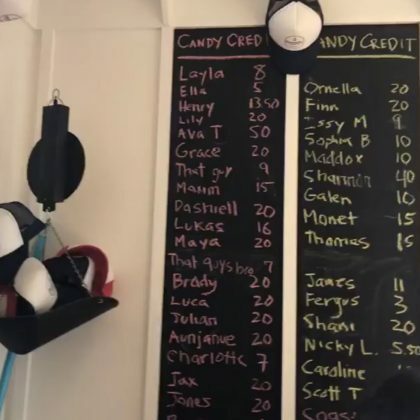 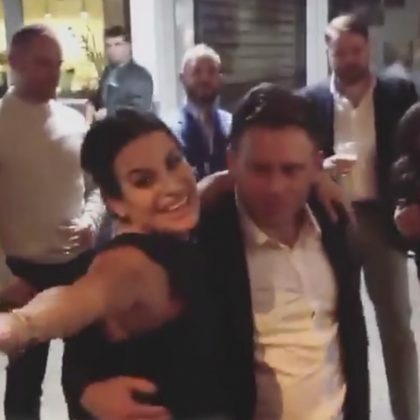 Kourtney Kardashian had a jar from Italy’s Latteria di Chiuro dairy store in August 2018. 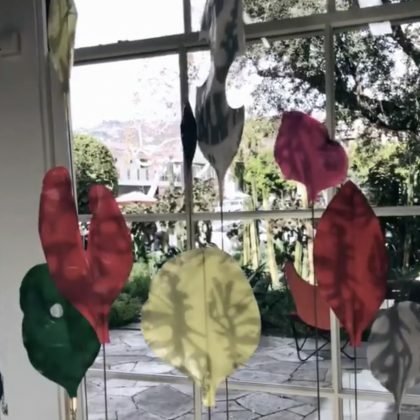 Nicky Hilton browsed the sculptures at the Paul Bert Serpette flea market in Saint-Ouen, France in July 2018. 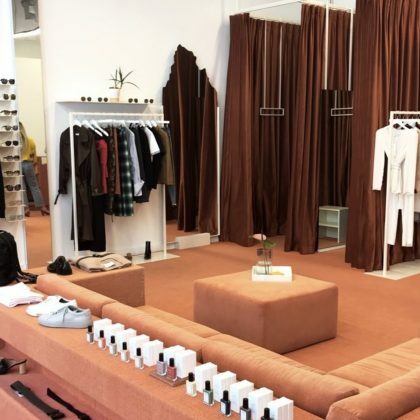 Adrienne Bailon checked into New York City, NY, USA’s Mansur Gavriel leather goods store in June 2018. 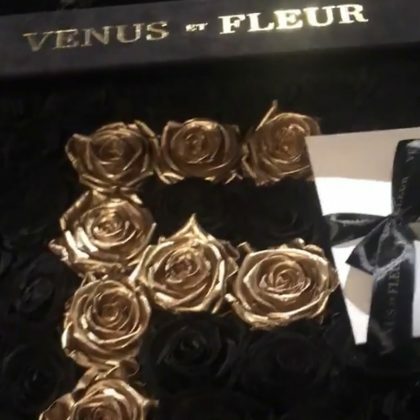 Ariana Grande was on the receiving end of some flowers from New York City, NY, USA’s Starbright Floral Design florist in June 2018. 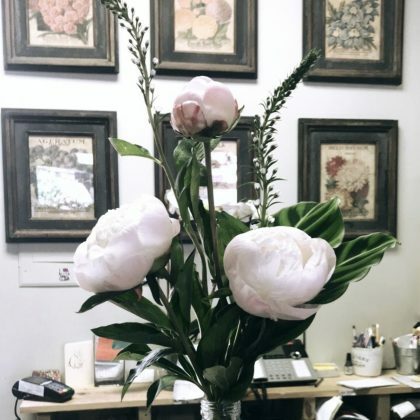 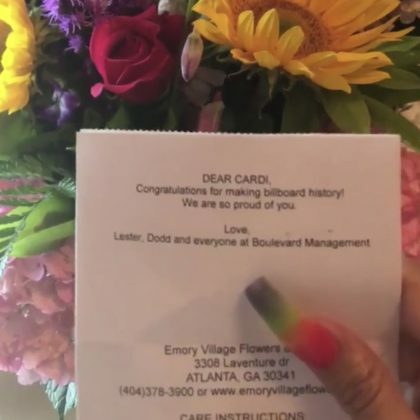 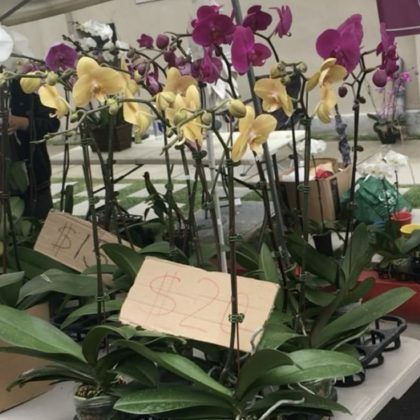 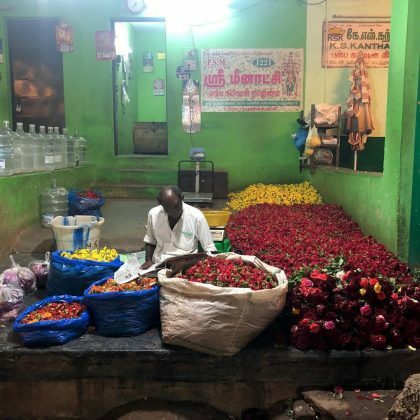 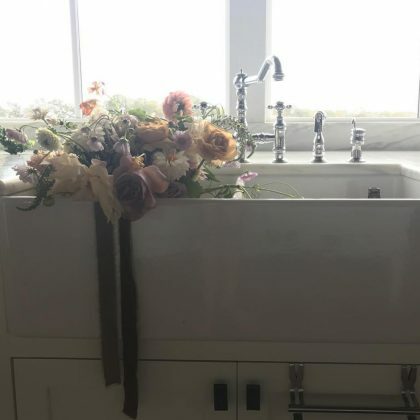 “I get all my arrangements from” Atlanta, GA, USA’s Candler Park Flower Mart is what Keri Hilson said about the peonies she had on display in June 2018. 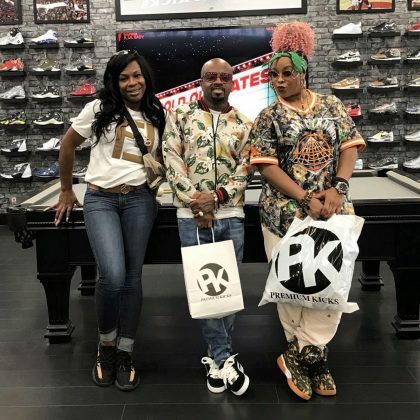 Da Brat shopped at Atlanta, GA, USA’s Premium Kicks shoe store in June 2018. 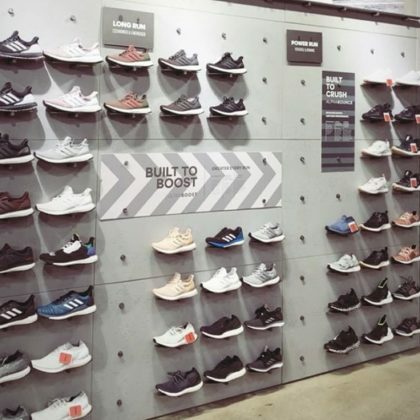 Jamie Chung said she and Bryan Greenberg were “Just a couple of sneaker heads in sneaker heaven” when they went shopping at New York City, NY, USA’s Extra Butter in June 2018. 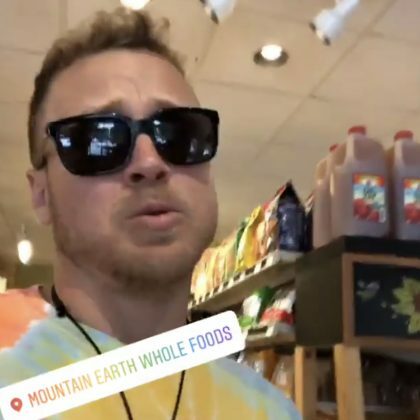 Spencer Pratt perused the aisles at Crested Butte, CO, USA’s Mountain Earth Whole Foods in June 2018. 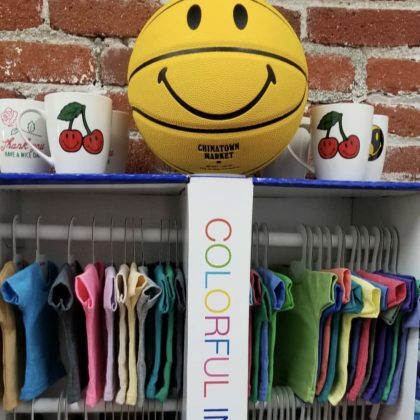 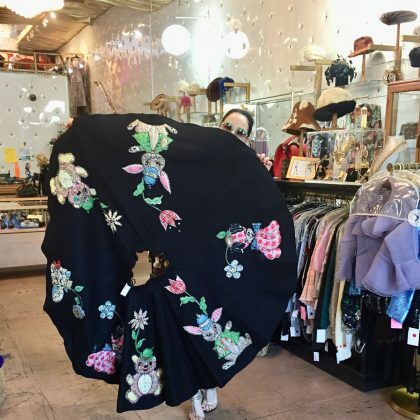 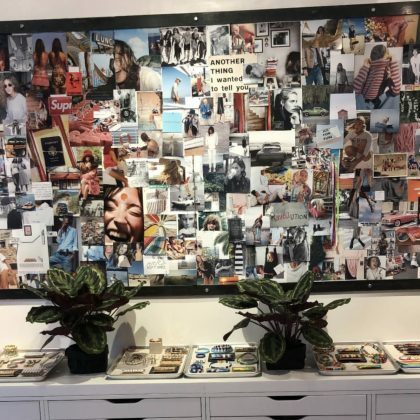 Heidi Klum was gathering some “#inspiration” from the fabric selection at Mood Fabrics, Los Angeles in June 2018. 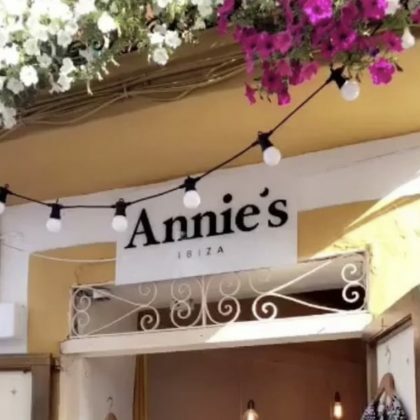 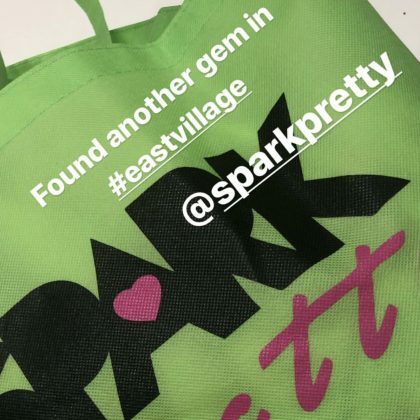 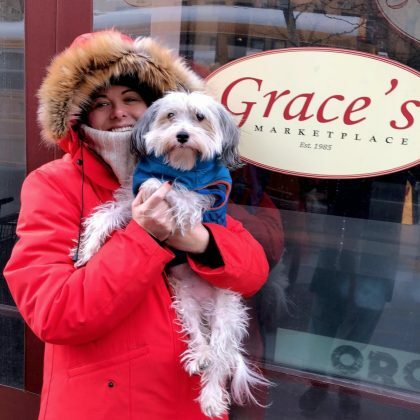 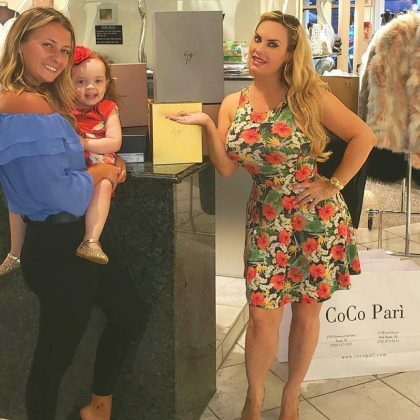 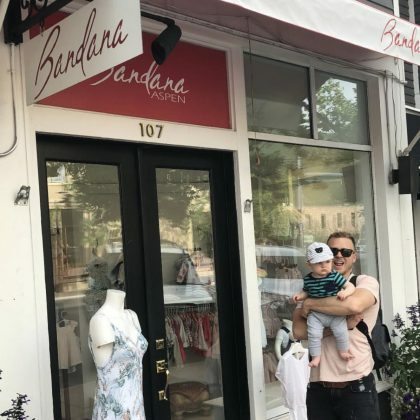 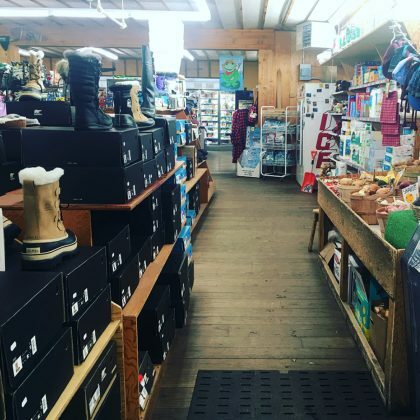 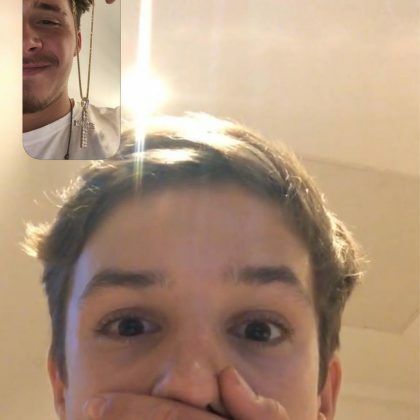 Heidi Pratt declared Bandana Aspen her “Favorite store in Aspen” when she and Spencer Pratt shopped with Gunnar Pratt in June 2018. 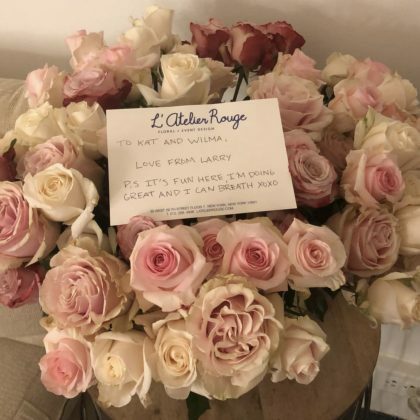 After the death of her dog Larry in June 2018, Katharine McPhee received an arrangement of flowers from New York City, NY, USA’s L’Atelier Rouge florist. 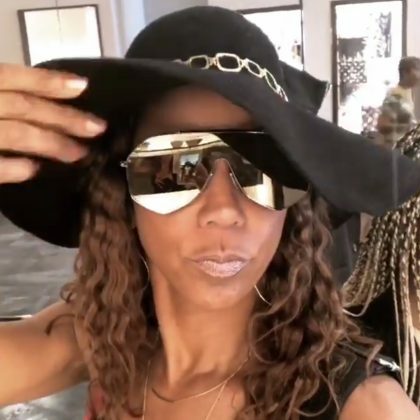 Holly Robinson Peete checked out the accessories while shopping at Beverly Hills, CA, USA’s Alexander McQueen, Los Angeles – Rodeo Drive in June 2018. 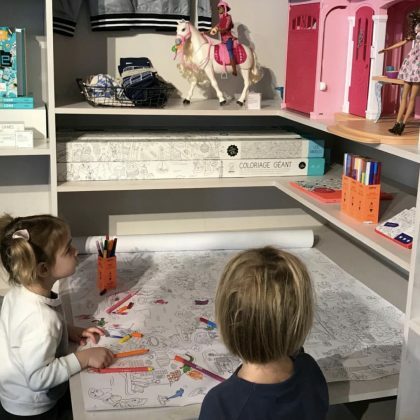 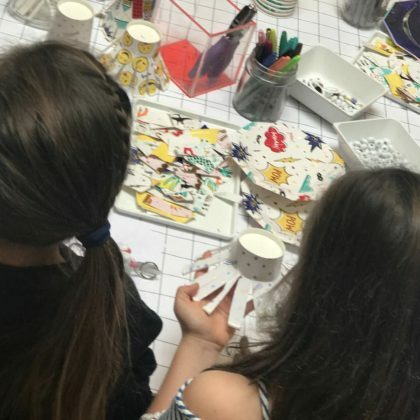 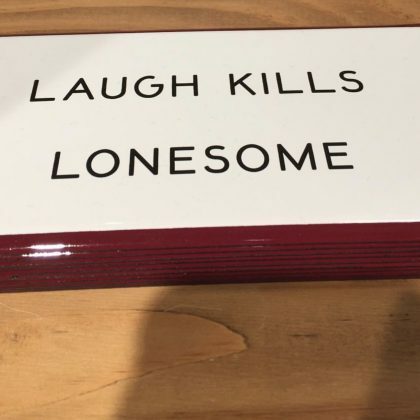 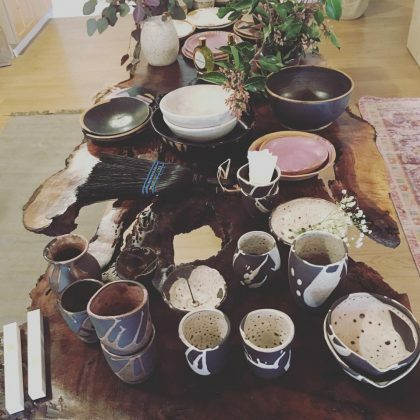 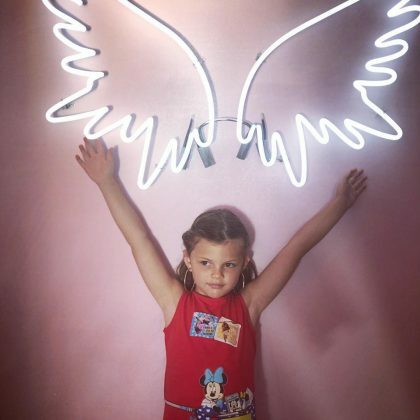 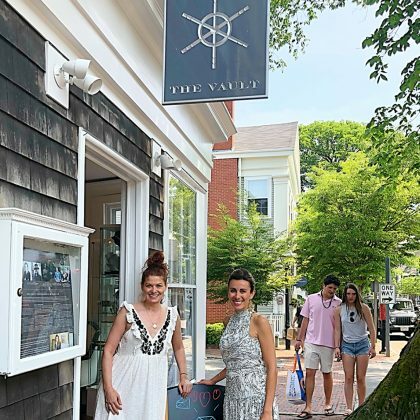 Mandy Moore called the “make your own bracelet station” at New York City, NY, USA’s Roxanne Assoulin Showroom “my heaven” when she dropped by the jewelry store in June 2018. 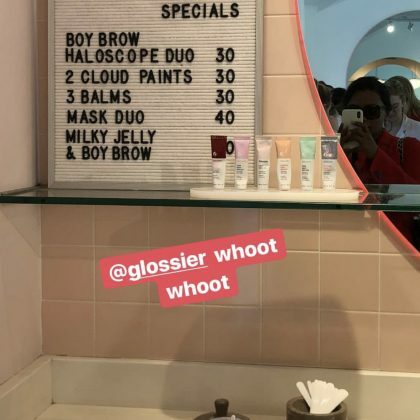 “It smells so good in here” is what Whitney Port said when she shopped at Los Angeles, CA, USA’s Glossier LA in June 2018. 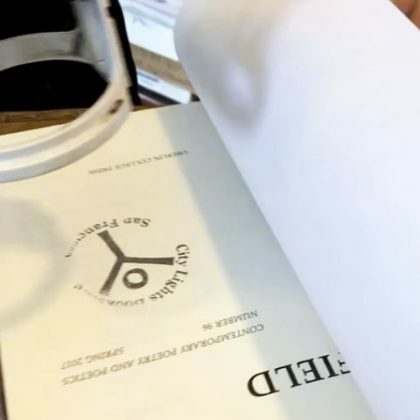 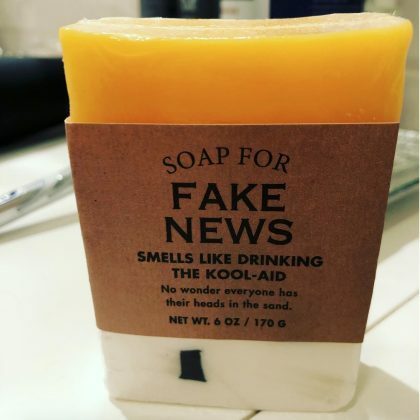 A “soap for fake news” made Brian Austin Green smile when he saw it while shopping at Agoura Hills, CA, USA’s The Flying Owl gift shop in May 2018. 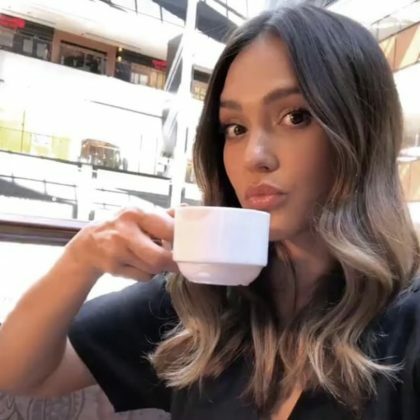 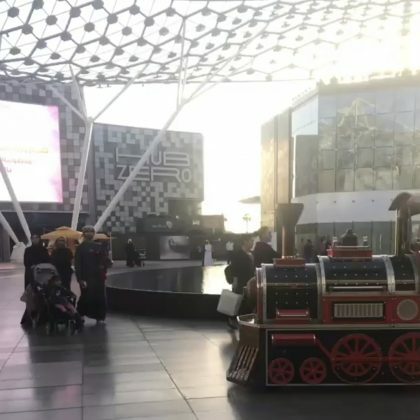 Jessica Alba had a hot beverage and checked out “the last emperors two cousins official gate” while exploring Beijing, China’s WF CENTRAL shopping center in May 2018. 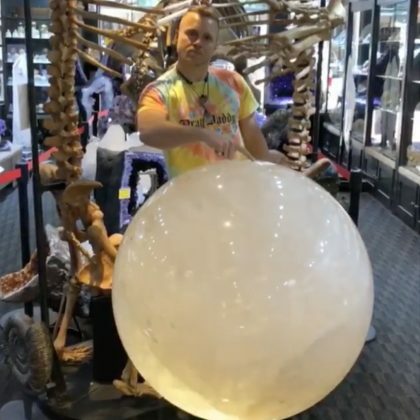 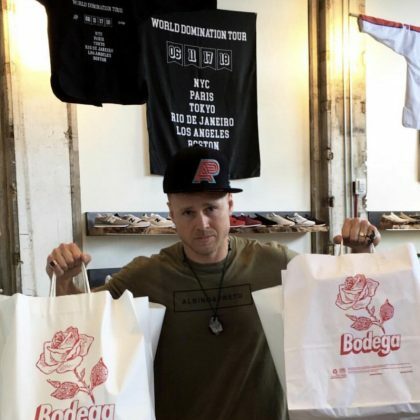 Spencer Pratt had two handfuls of bags after shopping at Los Angeles, CA, USA’s Bodega in May 2018. 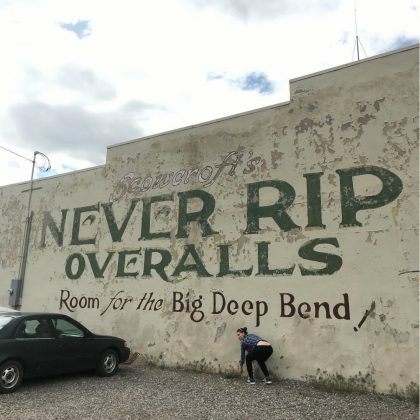 While “#RoadTrippin'” in May 2018, Hilary Swank posed for a photo in front of a mural outside of Koosharem, UT, USA’s Grass Valley Mercantile. 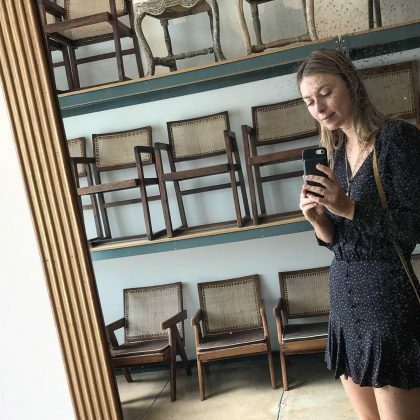 Maria Sharapova snapped a mirror selfie while shopping at the “Charming” La Boutique des Saints-Peres floral shop in Paris France in May 2018. 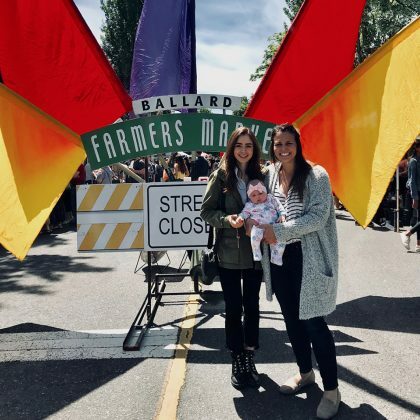 “Crêpes Anyone?” is what Lily Aldridge asked when she picked up the pastry from Los Angeles, CA, USA’s The Original Farmers Market in May 2018. 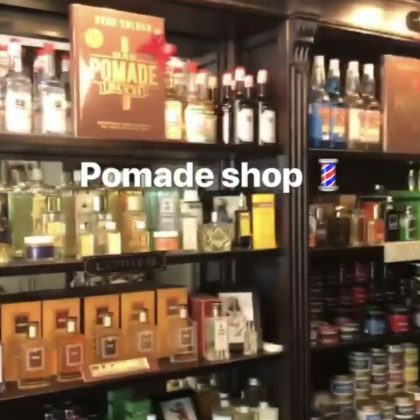 G-Eazy hit up PomadeShop München when he was in Munich, Germany in May 2018. 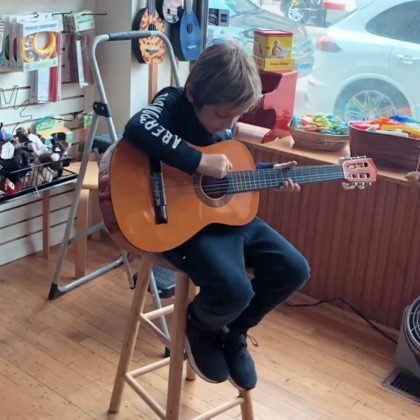 Giuliana Rancic accompanied son Duke Rancic “Guitar shopping” at Chicago, IL, USA’s Old Town School of Folk Music in May 2018. 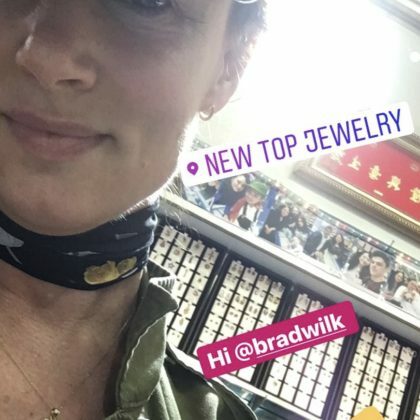 Molly Sims jokingly said, “pray for us,” when she stopped off at the Cabazon Outlets for some shopping in May 2018. 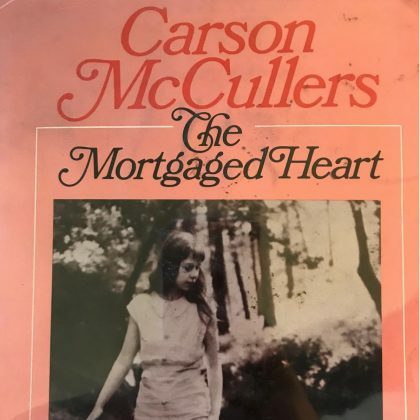 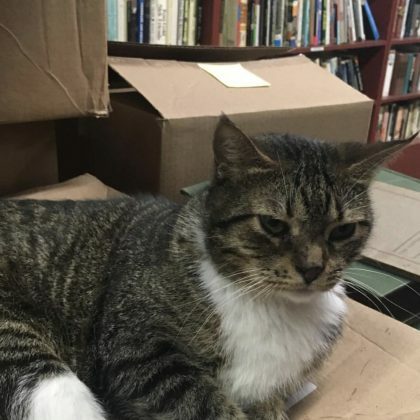 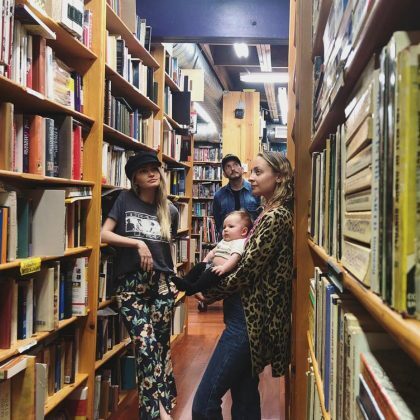 Becca Tobin browsed shelves at Victoria, BC, Canada’s Munro’s Books in April 2018. 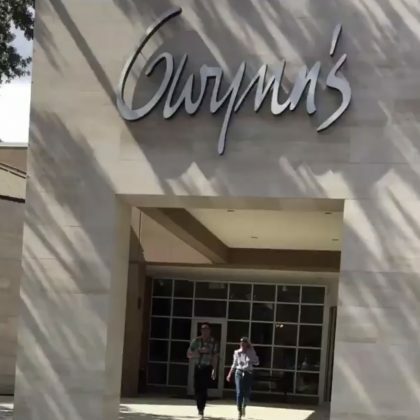 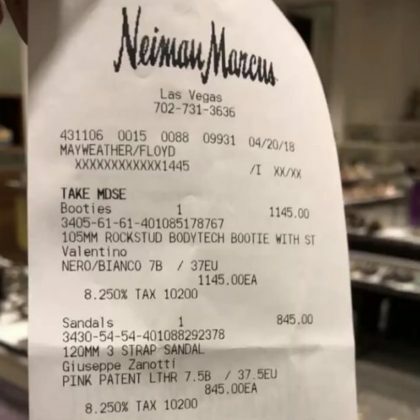 Floyd Mayweather racked up a “$47,778.33” bill when he went shopping at Neiman Marcus, Las Vegas in April 2018. 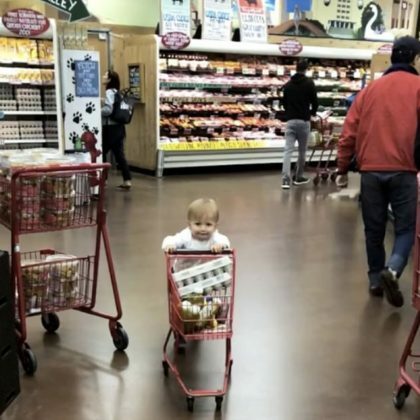 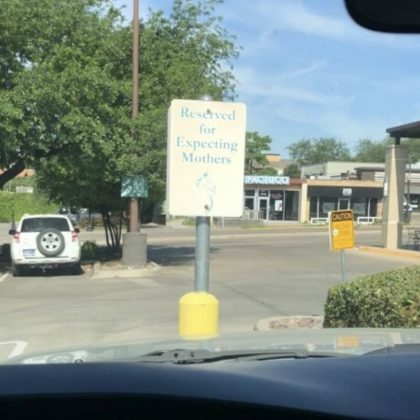 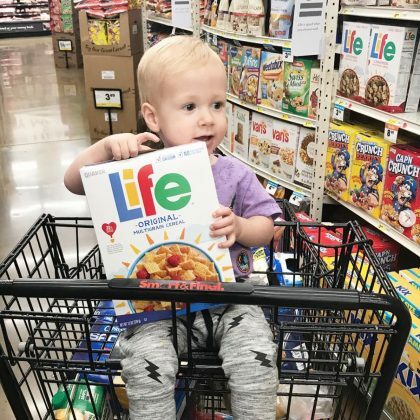 Catherine Giudici shopped at Dallas, TX, USA’s Trader Joe’s, Lower Greenville (403) in April 2018 alongside her son, who happily pushed one of the store’s mini shopping carts! 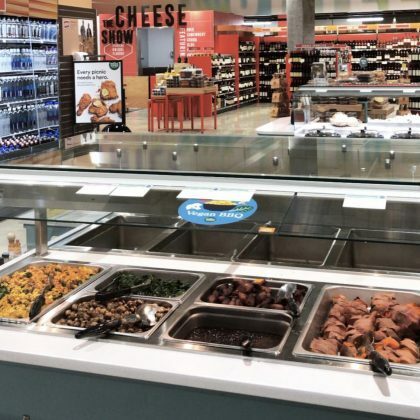 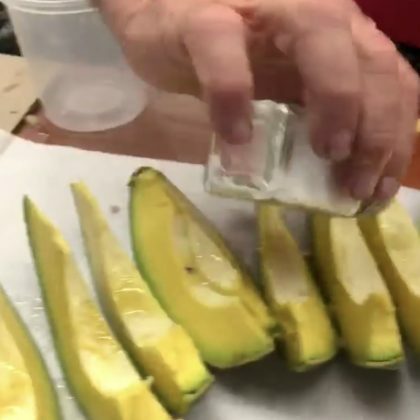 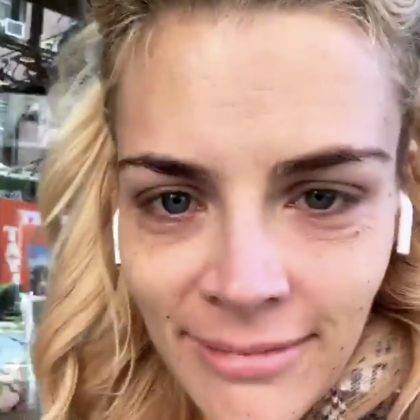 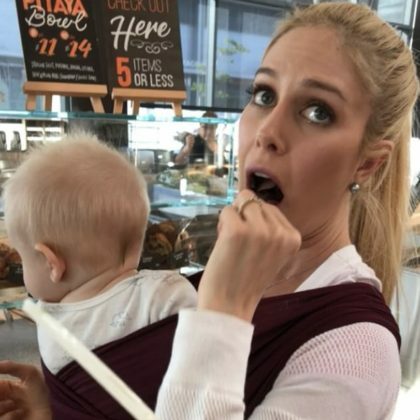 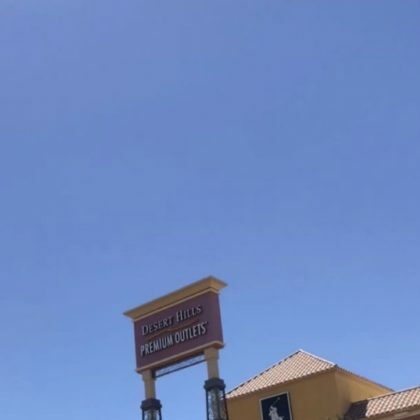 Heidi Pratt sampled some food when she and Spencer Pratt shopped at Erewhon, Santa Monica in April 2018. 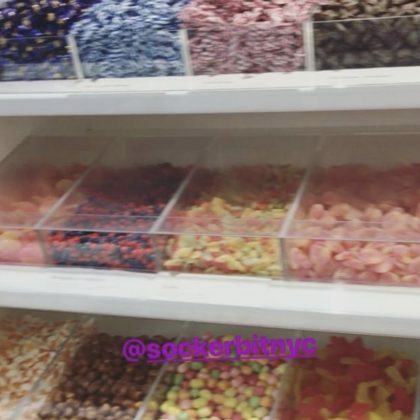 Rebecca Gayheart perused the bins stocked with sweets at Sockerbit, New York candy store in April 2018. 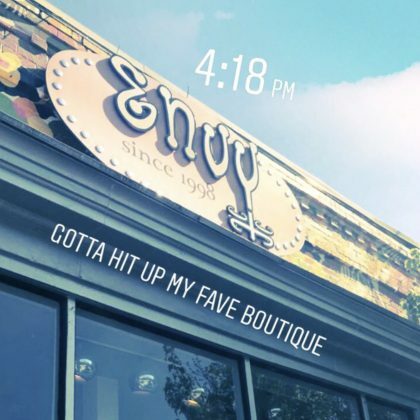 In April 2018, Keri Hilson said, “gotta hit up my fave boutique,” when she went shopping at Atlanta, GA, USA’s Envy Clothing & Shoes. 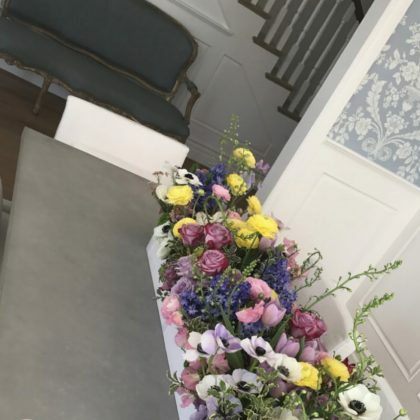 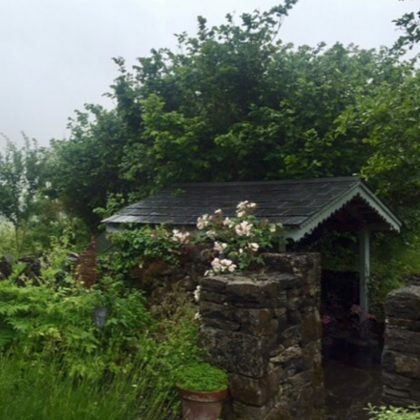 Elle Fanning received a gorgeous floral arrangement from Sherman Oaks, CA, USA florist Mark’s Garden in April 2018. 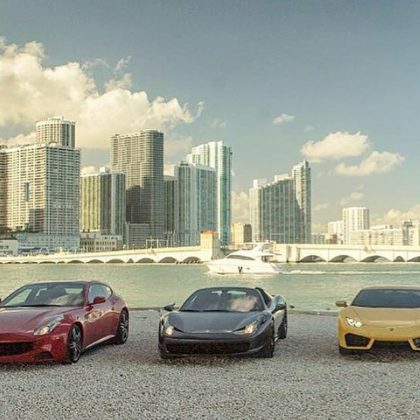 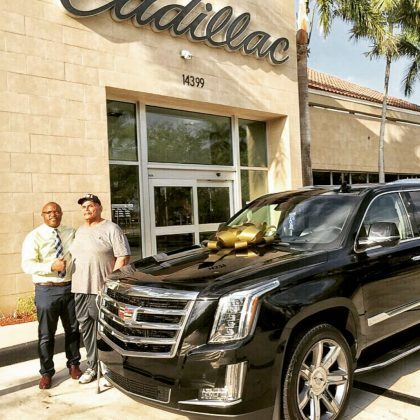 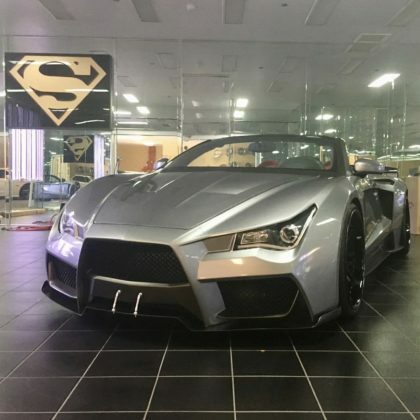 Shaquille O’Neal thanked St. Petersburg, FL, USA’s SuperCraft Cars “for coming by to service my baby” in April 2018. 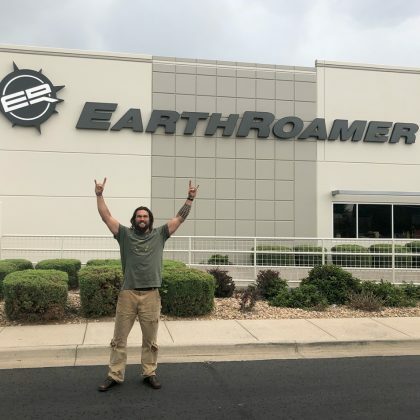 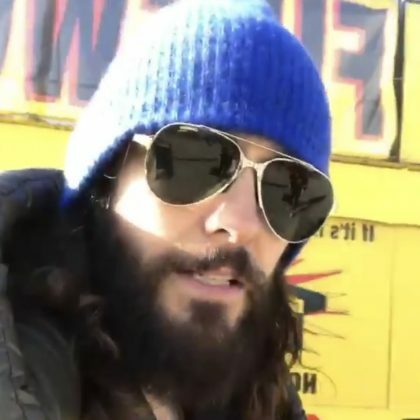 In April 2018, Jared Leto checked into Fresno, CA, USA’s TNT Fireworks. 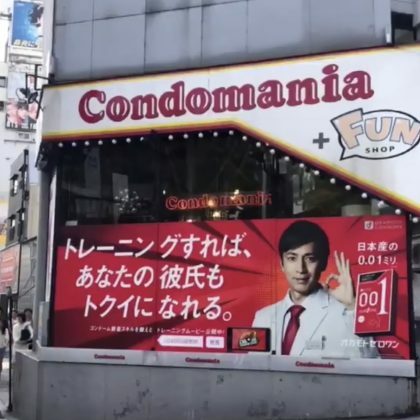 Billie Lourd pointed out Shibuya, Tokyo, Japan’s Condomania when she passed by in April 2018. 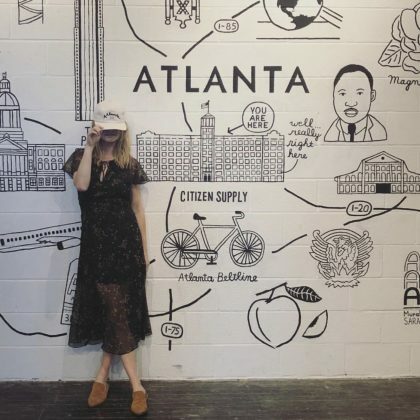 Candice Accola stopped by Atlanta, GA, USA’s Citizen Supply in April 2018. 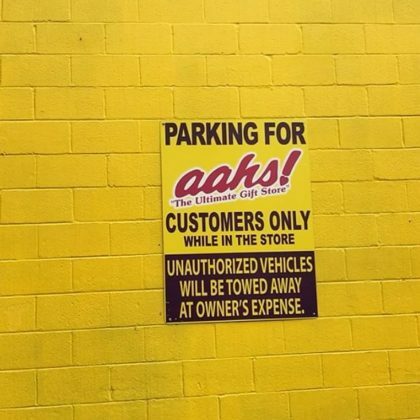 Anawalt Lumber, 11060 W Pico Blvd. 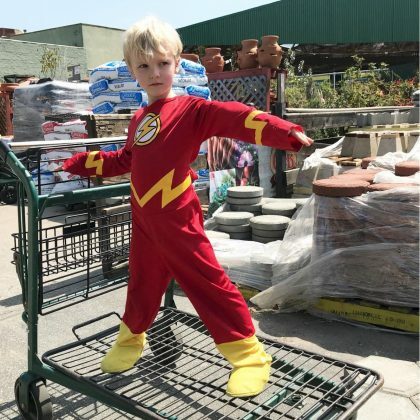 James Van Der Beek and his son shopped at Los Angeles, CA, USA’s Anawalt Lumber, 11060 W Pico Blvd. 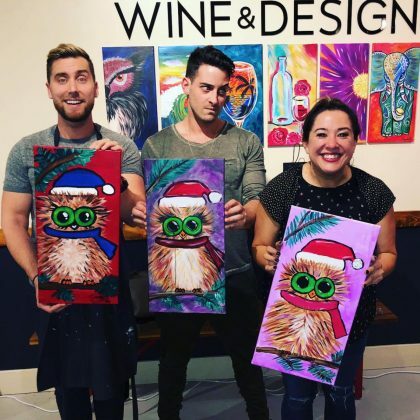 while “Tackling weekend projects” in March 2018. 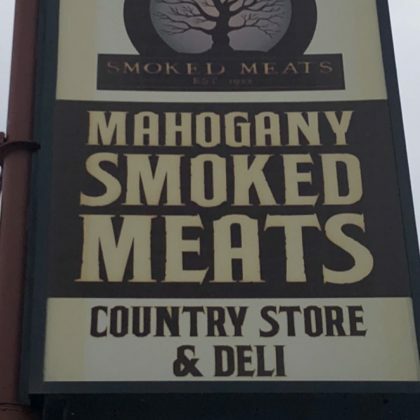 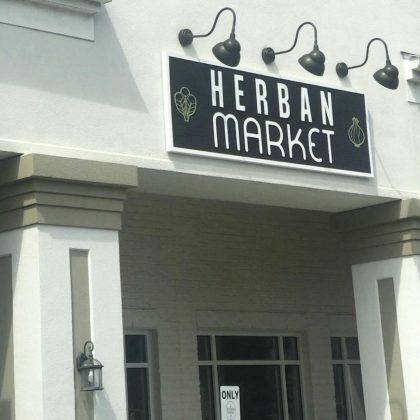 Colbie Caillat exclaimed she was “Back home!” when she went by Franklin, TN, USA’s Herban Market in March 2018. 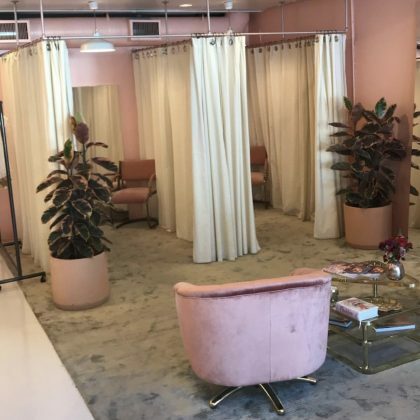 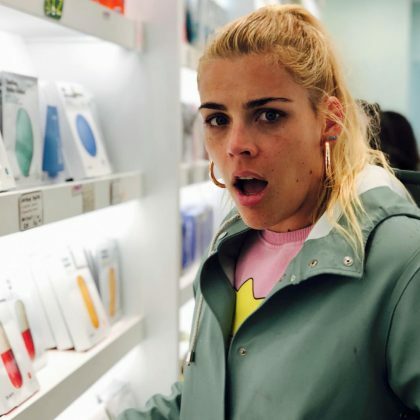 “Whoot whoot” is what Mindy Kaling said when she “Went downtown wandering” in March 2018 and ended up at New York City, NY, USA’s Glossier Showroom. 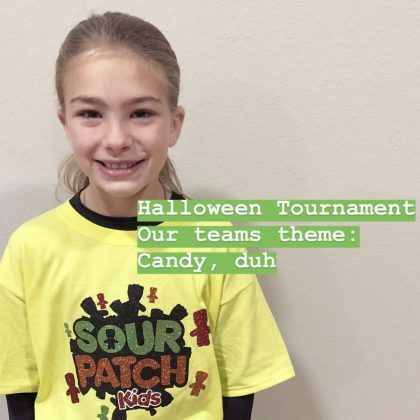 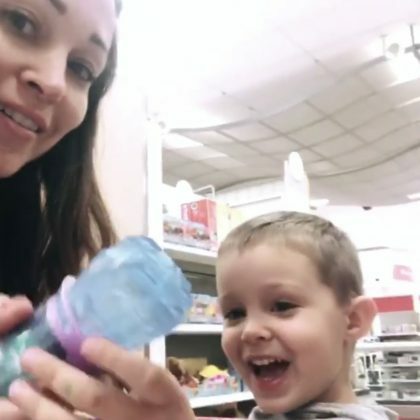 Giuliana Rancic had the “Sweetest Easter” celebration in March 2018 with Duke Rancic when they cozied up to the Easter bunny at Chicago, IL, USA’s 900 North Michigan shopping center. 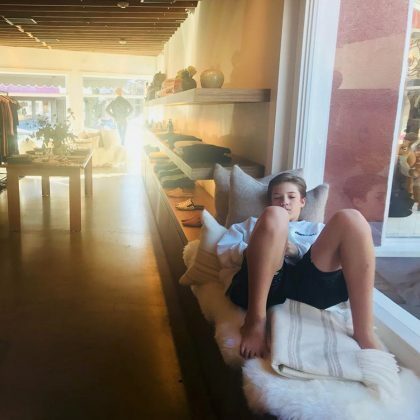 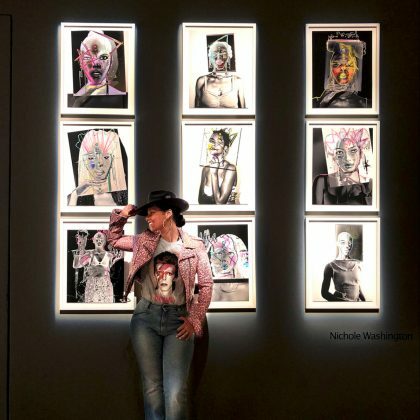 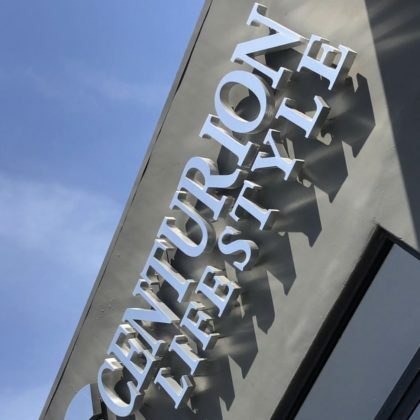 “The rain is gone & mommas out to play” is what Molly Sims said when she visited West Hollywood, CA, USA’s Pacific Design Center in March 2018. 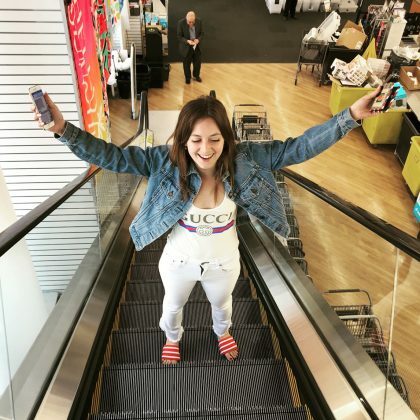 Autumn Reeser shopped at Los Angele, CA, USA’s Samy’s Camera in March 2018. 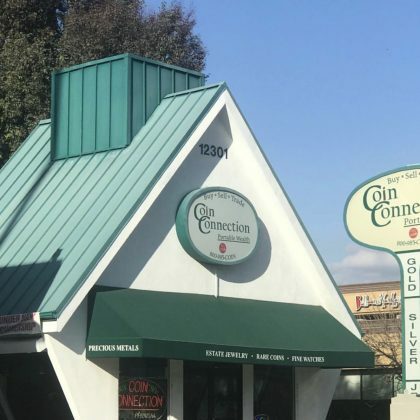 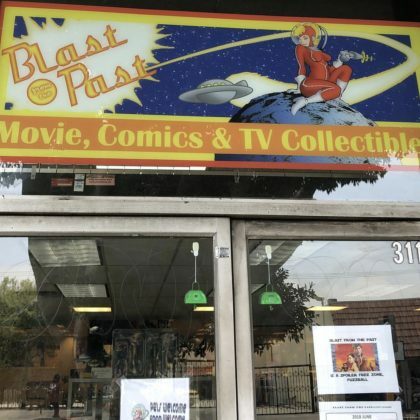 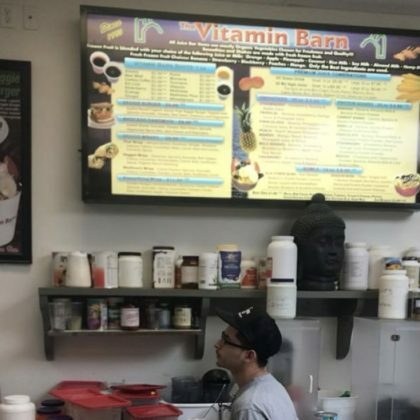 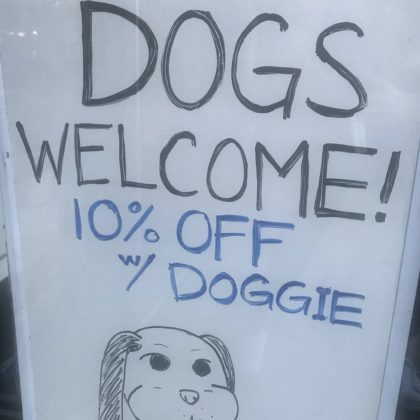 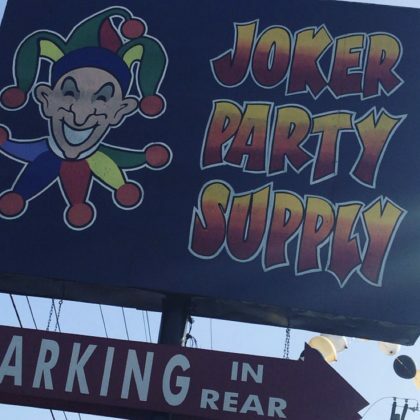 After seeing a sign that gave 10% off for customers who brought in their dogs, Whitney Cummings said, “I love you” to Los Angeles, CA, USA’s Meltdown Comics and Collectibles. 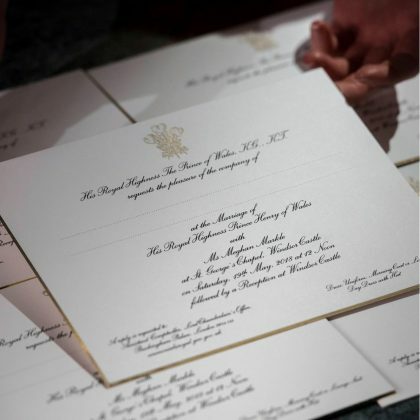 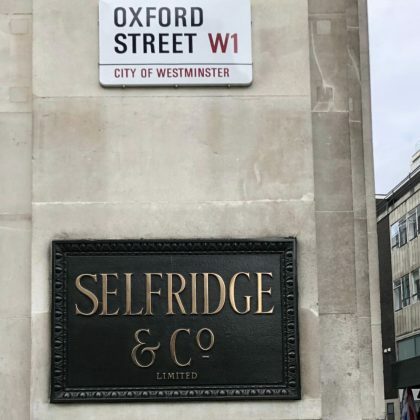 “Oh i did the damn thing” is what Mindy Kaling said after a March 2018 visit to London, England, UK’s Selfridges, London department store. 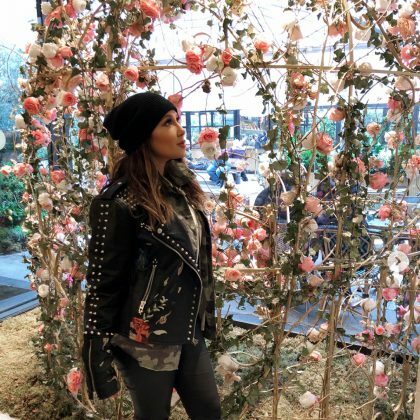 Adrienne Bailon “got to enjoy” Paris, France’s 86 CHAMPS in March 2018 and explained the store as, “@loccitane you smell the ingredients @pierreherme you taste them… @86champselysees they come together! 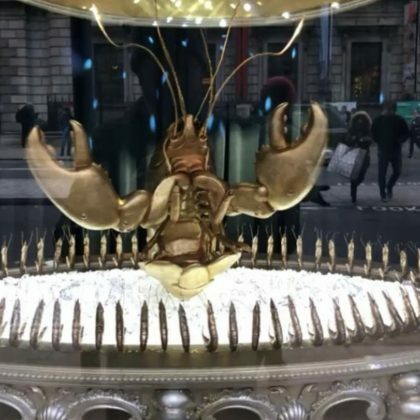 That’s right… Pierre Hermé & L’Occitane have created an experience on the Champs-Élysées! 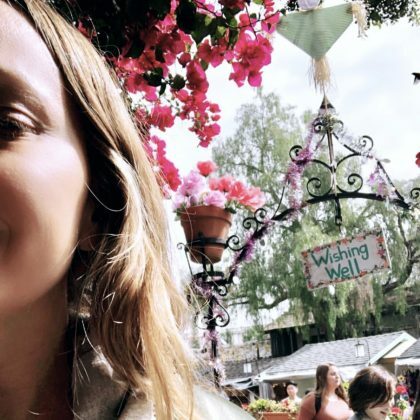 Jennifer Meyer “Made a wish” at the wishing well inside Los Angeles, CA, USA’s Olvera Street marketplace in March 2018. 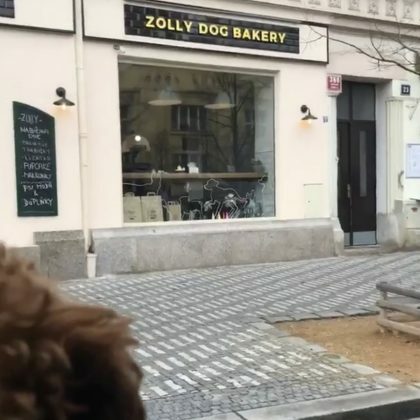 Orlando Bloom brought his dog to check out the pet-approved treats at Prague, Czech Republic’s Zolly Dog Bakery in March 2018. 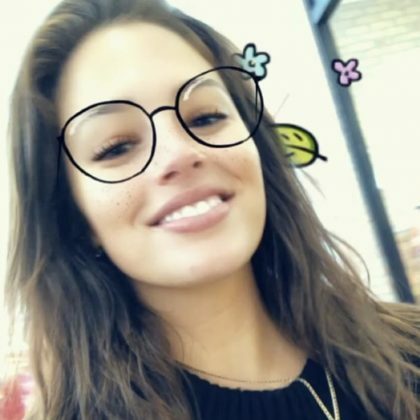 Lincoln, NE, USA native Ashley Graham walked around Gateway Mall in March 2018. 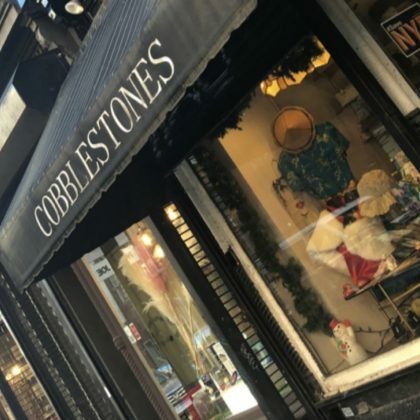 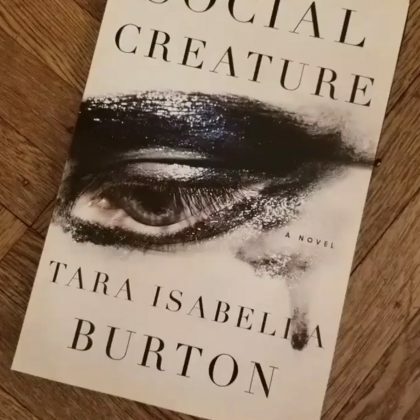 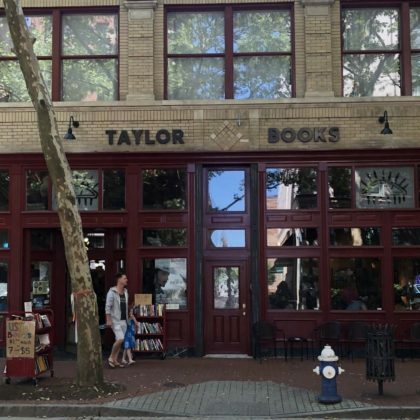 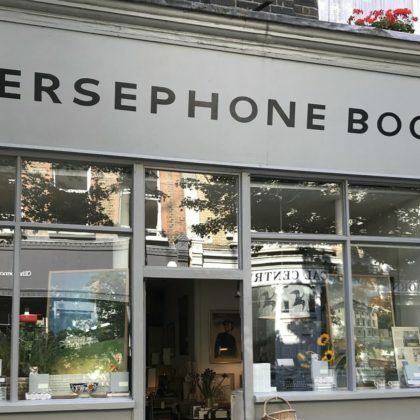 In March 2018, Sarah Jessica Parker gave New York City, NY, USA’s Three Lives & Company book store a shoutout — she was reading Social Creature by Tara Isabella Burton. 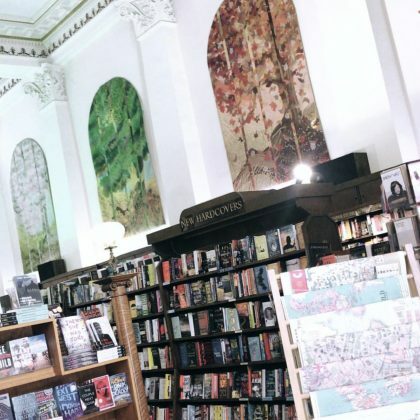 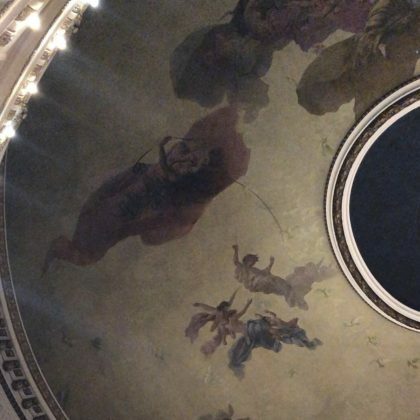 Katy Perry admired the ceiling art when she visited Buenos Aires, Argentina’s El Ateneo Grand Splendid book store in March 2018. 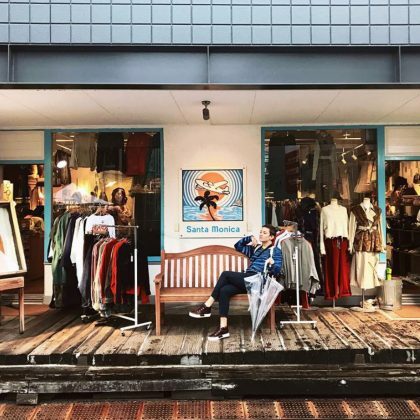 “CHICAGO IN JAPAN” is how Kim Kardashian — mother of Chicago West —captioned her photo outside Tokyo’s Chicago, Harajuku used clothing store in March 2018. 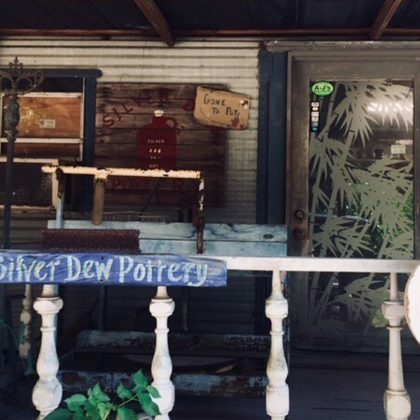 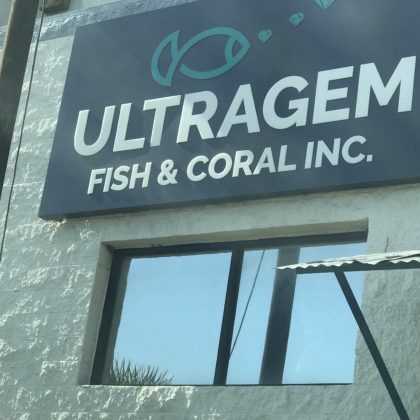 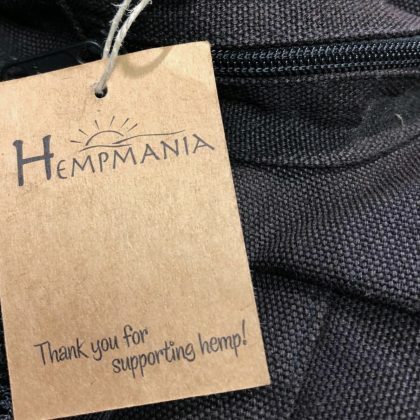 Alicia Silverstone shopped at Island Hemp & Cotton — a “Hemp store in Kapa’a,” Kaui, HI, USA — in March 2018 and shared, “We got this backpack” by Hempmania. 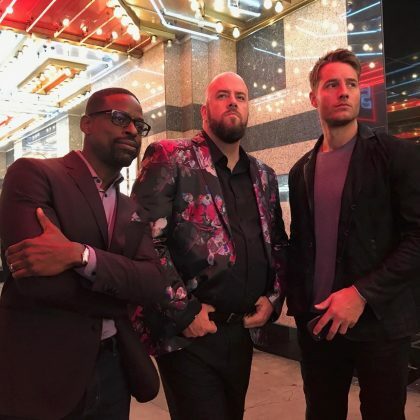 This Is Us stars Justin Hartley, Sterling K. Brown, and Chris Sullivan filmed a scene for Toby’s bachelor party at Las Vegas, NV, USA’s Fremont Street Experience that aired in February 2018. 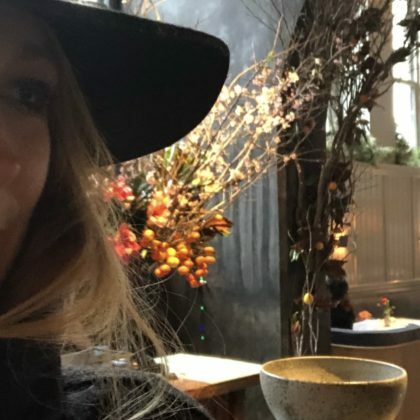 “Pretending to be a mannequin so I can live here” is what Blake Lively said while browsing Roman and Williams Guild — an “incredible new restaurant and store” — in February 2018. 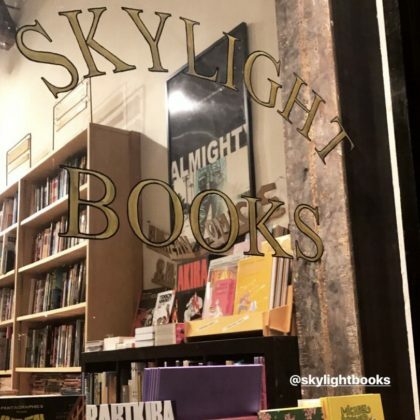 Kelly Rutherford browsed New York City, NY, USA’s Albertine book store in February 2018. 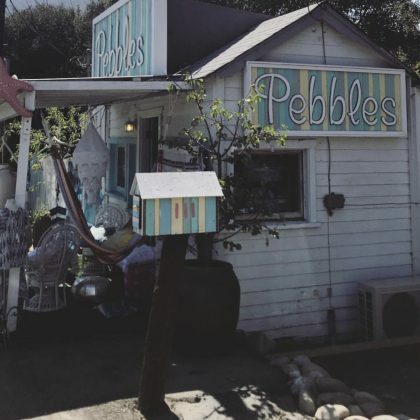 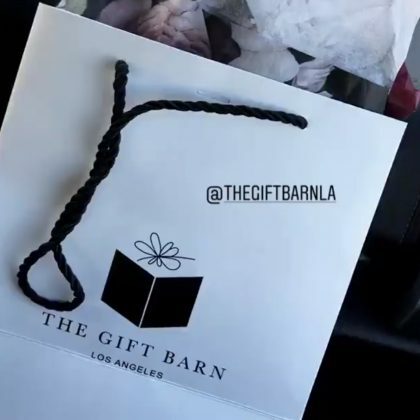 “Just moved to my neighborhood & I’m pumped” is what Haylie Duff said in February 2018 about Sherman Oaks, CA, USA’s The Gift Barn. 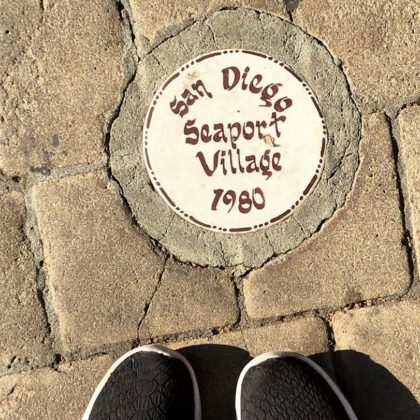 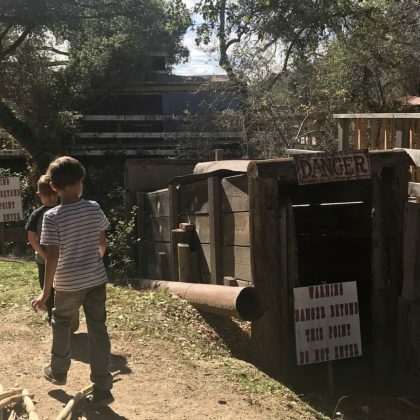 Autumn Reeser and her sons made a stop at Fallbrook, CA, USA’s Valley Fort Village in February 2018. 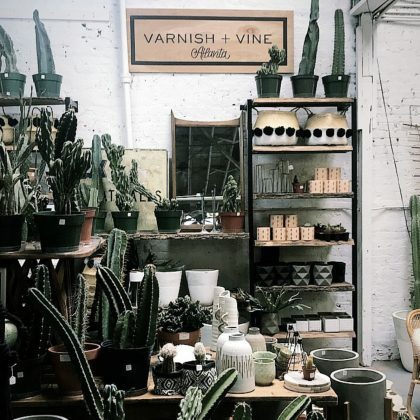 Whitney Port experienced “Cuteness overload” and said “Mama’s shoppin” when she browsed the racks at West Hollywood, CA, USA’s For Love & Lemons in February 2018. 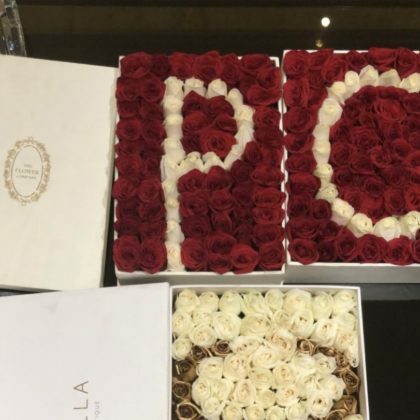 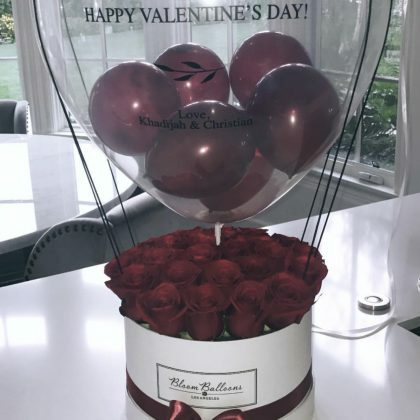 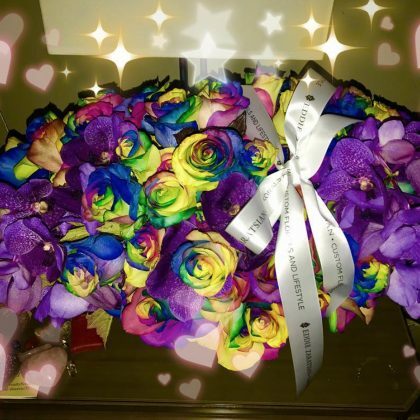 Khloe Kardashian received an arrangement from Bloom Balloons that was sent by her friend Khadijah Haqq McCray on Valentine’s Day in February 2018. 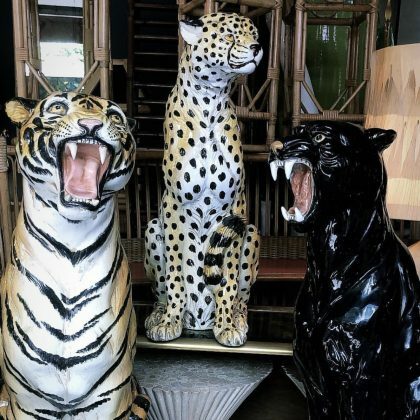 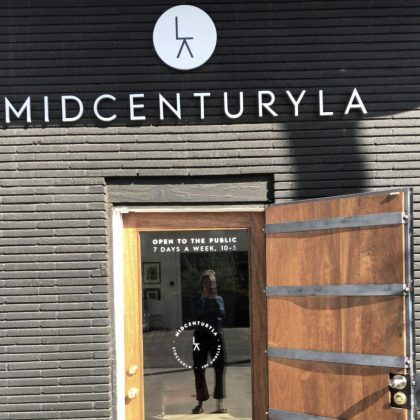 Whitney Port was “on the hunt” when she went shopping for furniture at Los Angeles, CA, USA’s MIDCENTURYLA in February 2018. 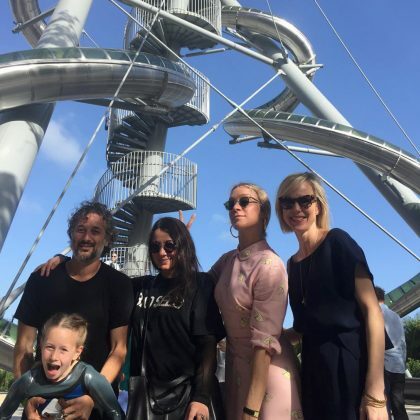 While at the Aventura Mall in February 2018, Chloë Sevigny posed for a group photo in front of the Aventura Slide Tower. 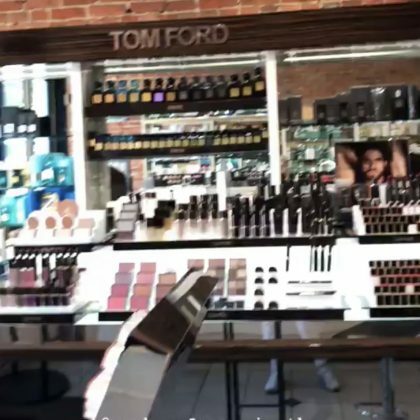 Lily Aldridge had “Fun” shopping for cosmetics at VIOLET GREY, Melrose Place in January 2018. 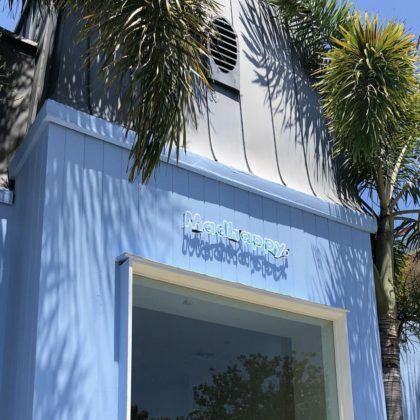 Lily Aldridge shopped at Isabel Marant, Melrose Place in January 2018. 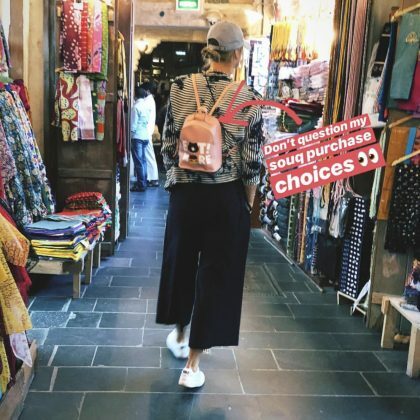 Maria Sharapova shopped at Les Ateliers Courbet furniture store in January 2018. 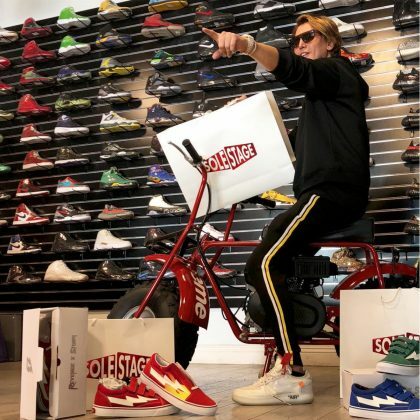 Jonathan Cheban shopped for shoes at SoleStage in January 2018. 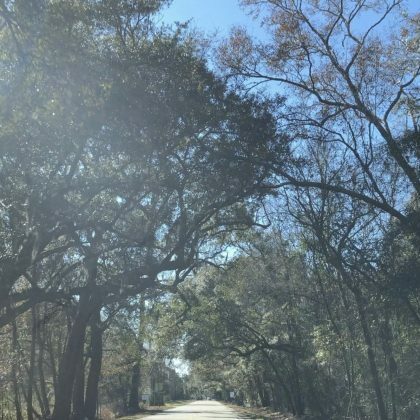 Tiffani Thiessen traveled to Ambrose Family Farm during a January 2018 trip to South Carolina. 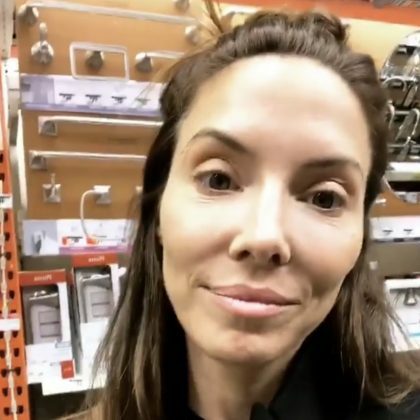 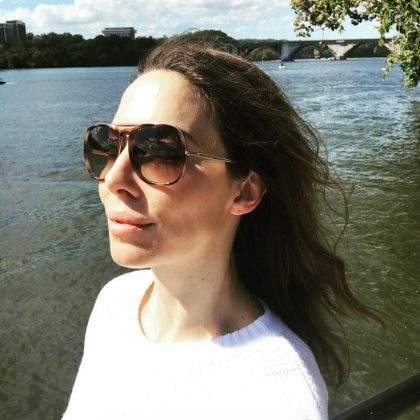 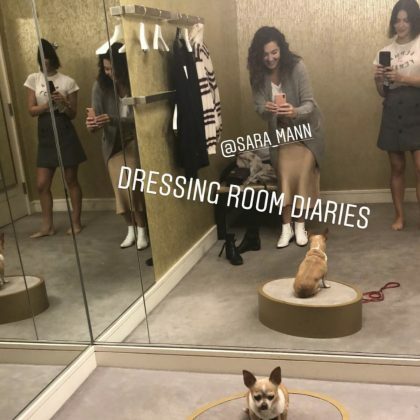 Whitney Cummings was “pretending to be interested in shower heads” when she shopped at The Home Depot, Woodland Hills on a Saturday night in January 2018. 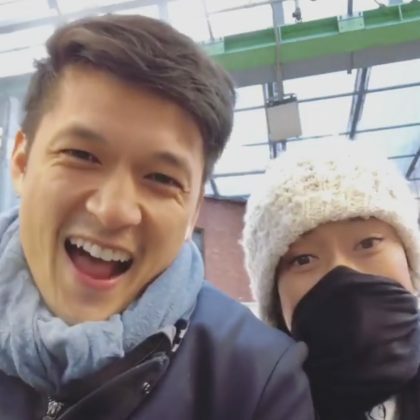 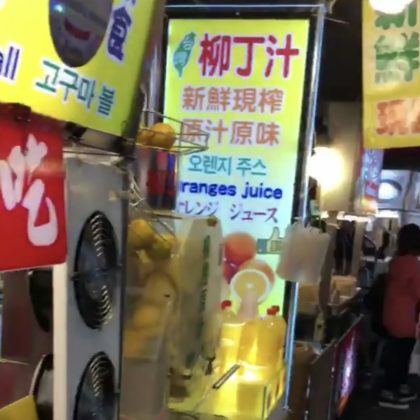 “Layover in S Korea so we rode into Seoul to EAT” is what Harry Shum, Jr. said about his stop at Gwangjank Market in January 2018. 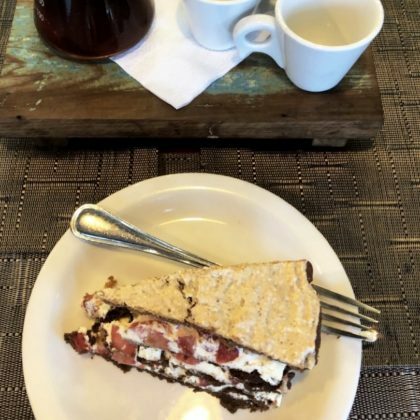 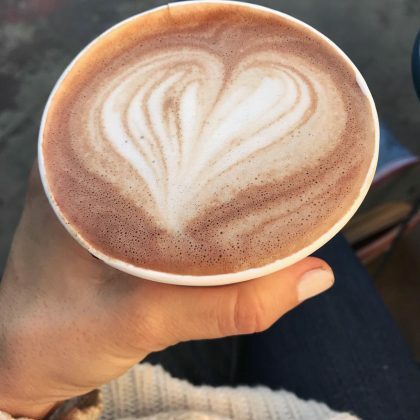 Alessandra Ambrosio had a slice of something sweet while at Mercado São Jorge in January 2018. 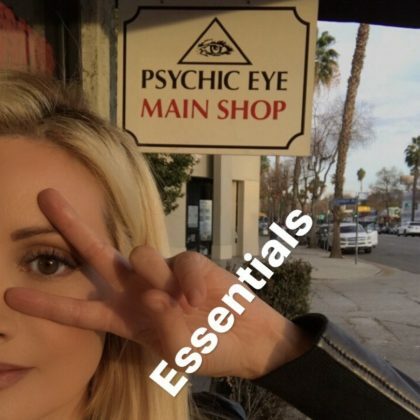 Holly Madison shopped for some “Essentials” at Psychic Eye Book, Las Vegas/Charleston in January 2018. 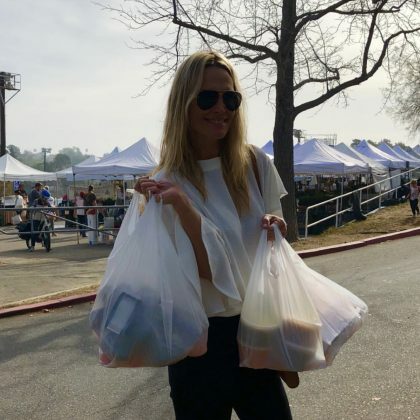 Pacific Palisades Farmers Market was “Stop 2 of the day” for Molly Sims in January 2018. 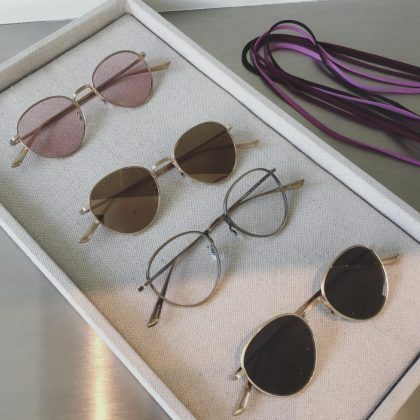 Christina Milian was “Trying on glasses” at Optic St-Honoré in January 2018. 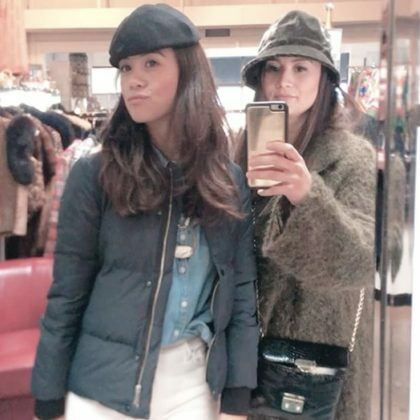 Catherine Giudici went shopping with sister at Vintage Martini in January 2018. 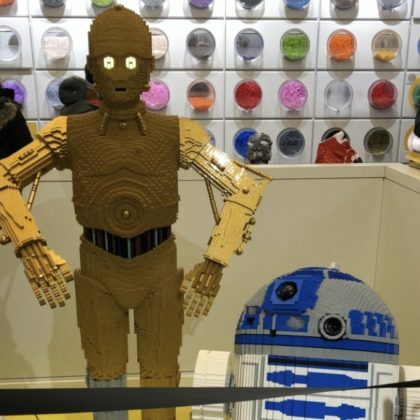 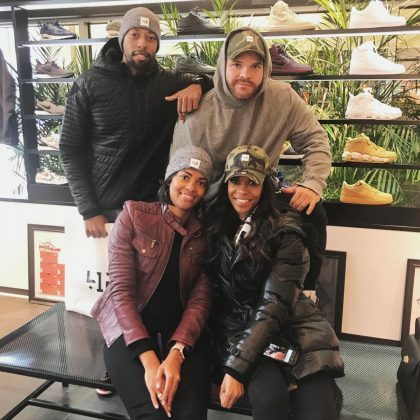 Christina Milian took a look around the City Walk shopping mall in January 2018. 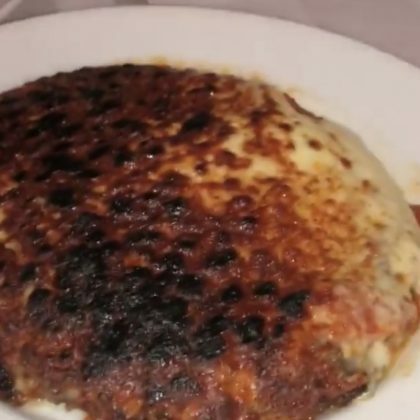 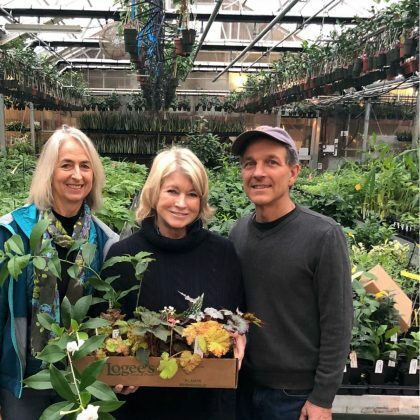 Martha Stewart had a “Delicious super colossal from Carmine’s market” for breakfast in January 2018. 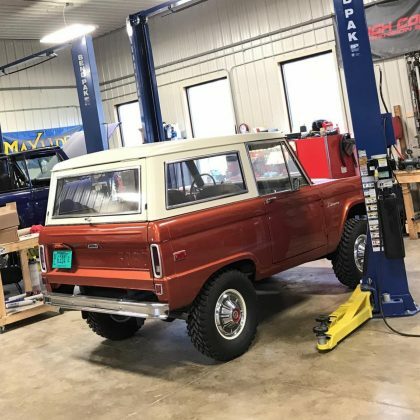 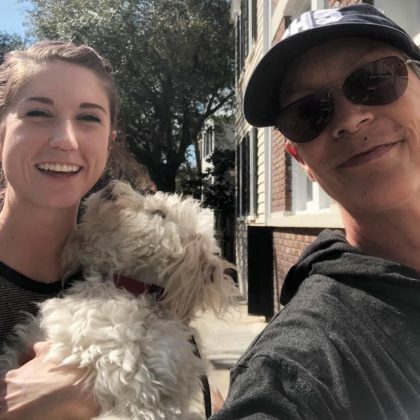 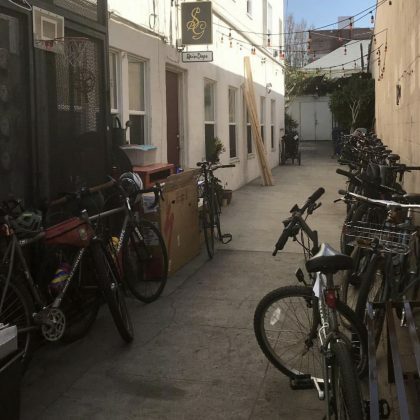 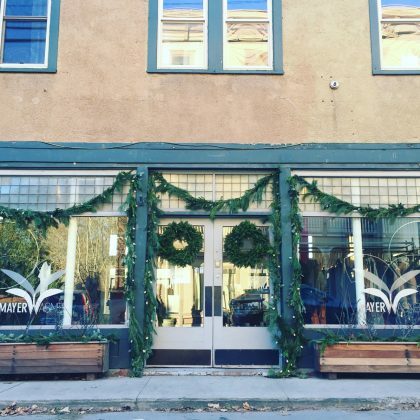 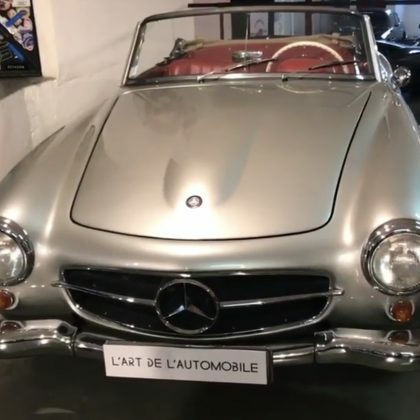 Autumn Reeser excitedly shared a shot of “my new ride” when she was at The Wheelhouse bicycle shop in December 2017. 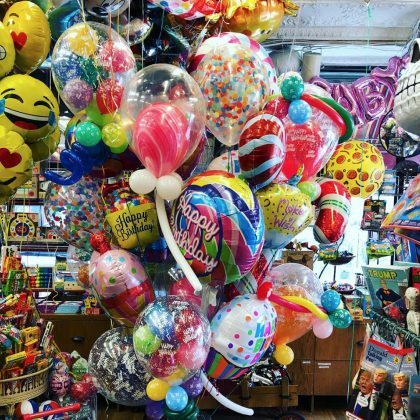 Aubrey O’Day was “making a balloon wall” for a “NYE photo booth” so she stopped by Joker Party Supply to stock up in December 2017. 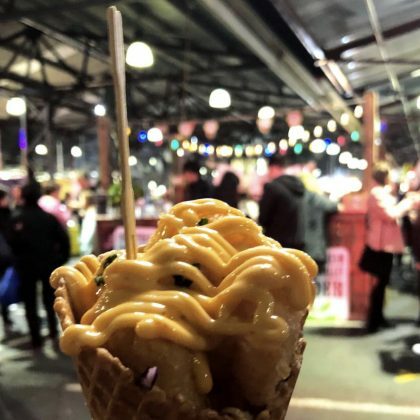 Daniel Dae Kim wandered around the Raohe Street Night Market in December 2017. 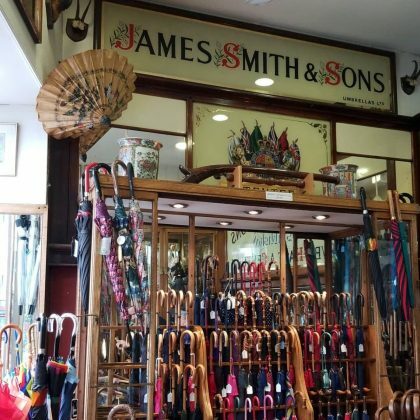 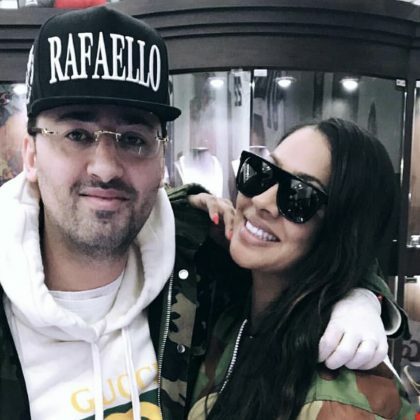 Angela Simmons thanked Daniel’s Leather “for making me and my son some custom pieces” — she shared that she ordered “#BikerJackets” from the leather store in December 2017. 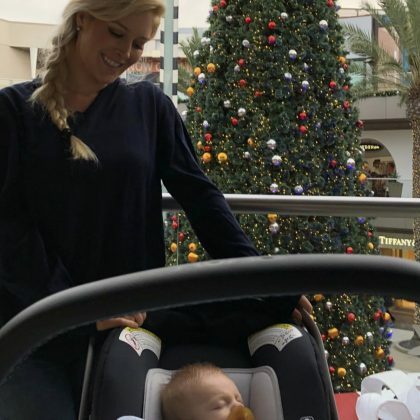 Kendra Wilkinson-Baskett took a turn on the carousel at Seaport Village in December 2017. 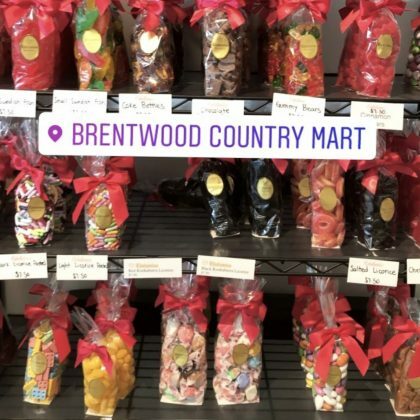 “Pecans and pickups” is how Becca Tobin described her December 2017 stop at Merritt Pecan Co. & General Store. 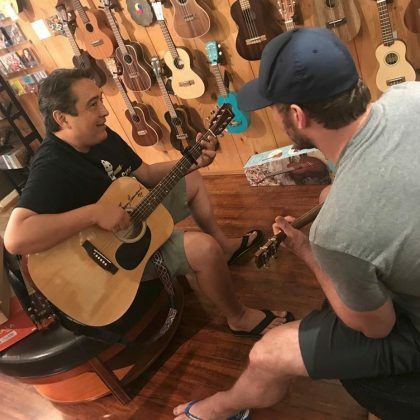 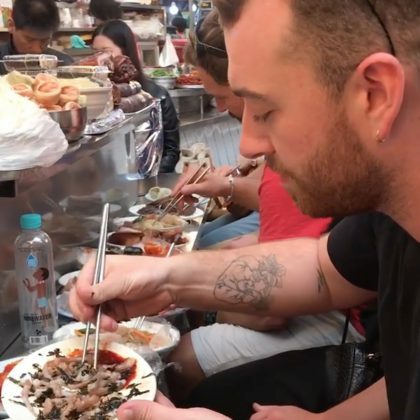 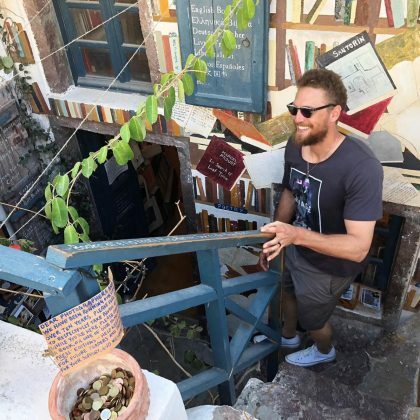 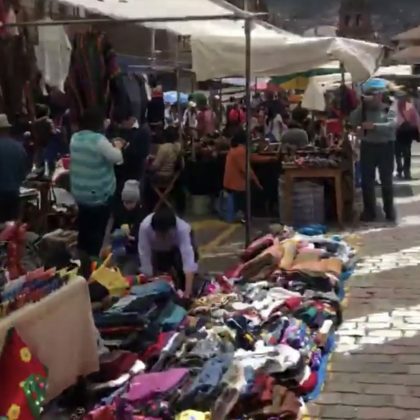 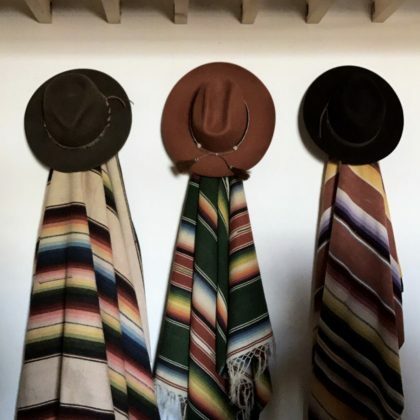 “Cusco Market is popping!” is what Bryan Greenberg said when he and Jamie Chung browsed the goods at San Pedro Market in December 2017. 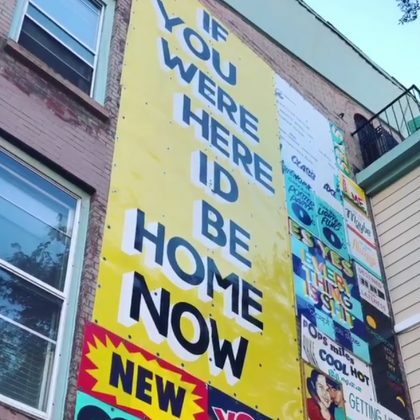 “Bonjour New York! 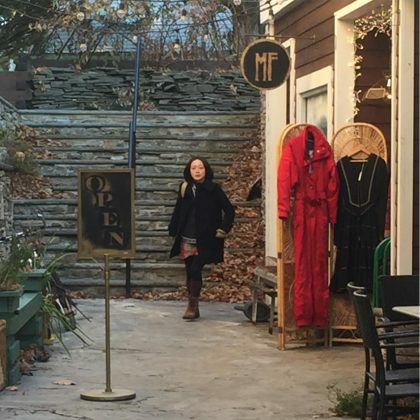 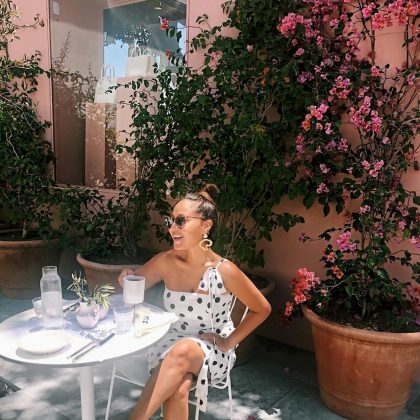 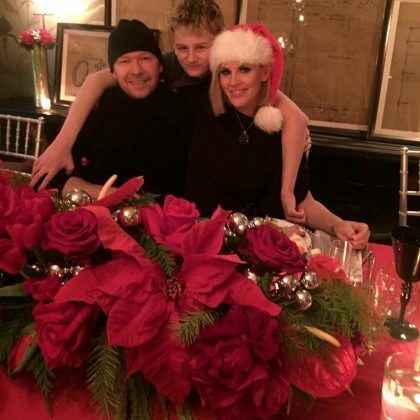 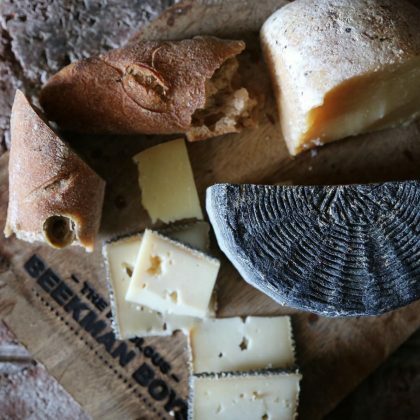 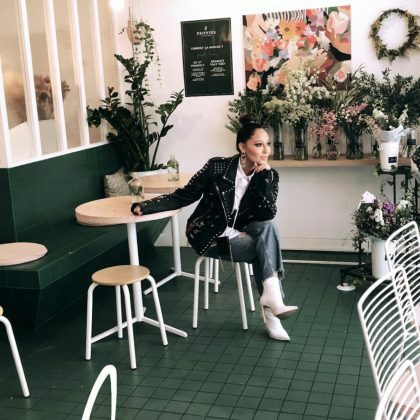 Home for the holidays” is what Adrienne Bailon said when she sipped “Apple cider” and shopped at Sézane in December 2017. 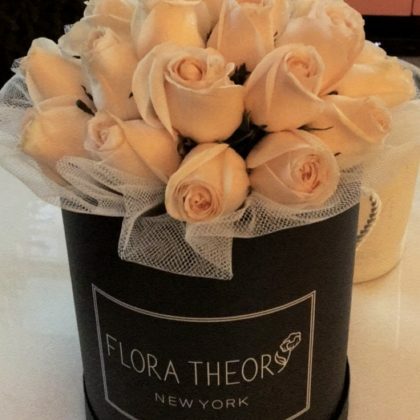 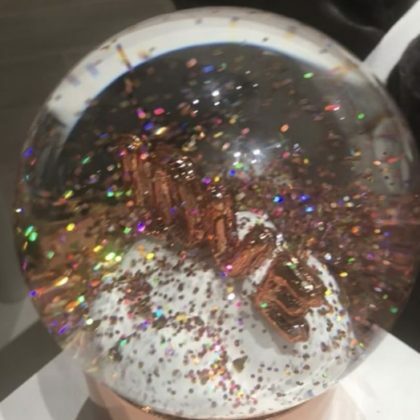 Ashley Benson put a bucket of roses from Flora Theory on display in December 2017. 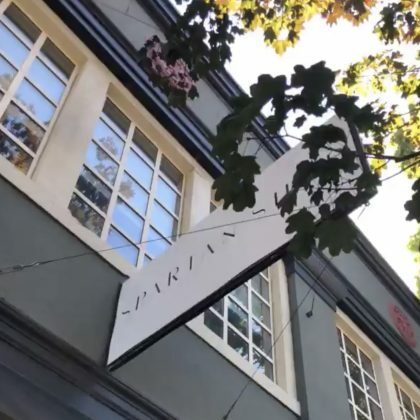 Christina Milian said she was “buying up the whole store” when she shopped at Maxfield, Melrose in December 2017. 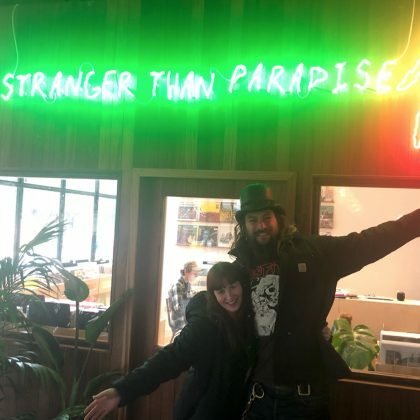 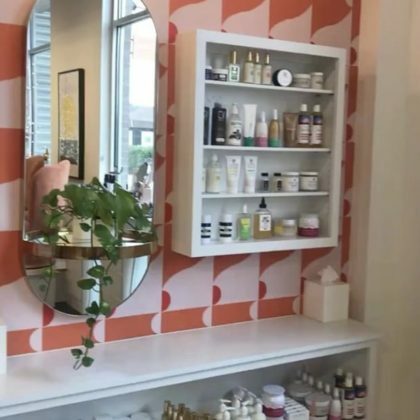 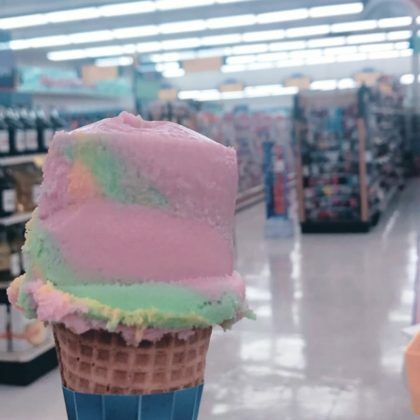 In December 2017, Kacey Musgraves called Lemon Laine “one of my favorite stores in Nashville” and gave a shoutout to the beauty store’s “amazing holistic beauty” products. 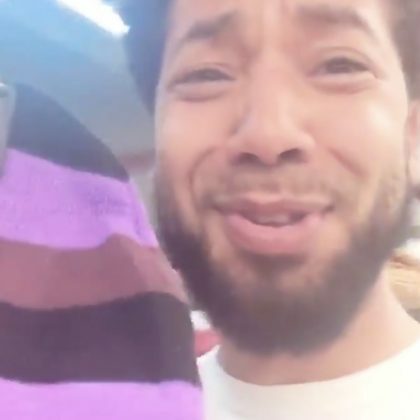 In December 2017, Raven-Symoné teased that she “Sent bae” Jussie Smollett “to buy condoms and cool ranch Doritos” at Pink Dot. 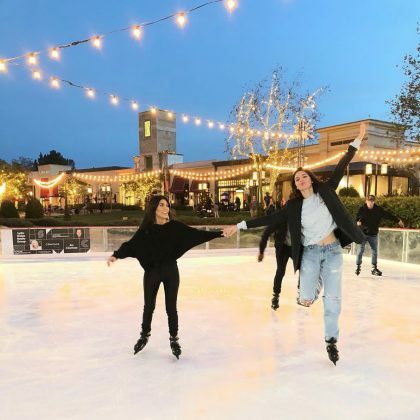 Kourtney Kardashian and Kendall Jenner skated on the ice skating rink at The Lakes at Thousand Oaks in December 2017. 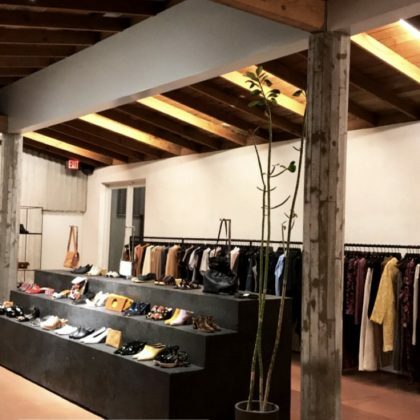 Jonathan Cheban shopped at Alchemist — a clothing store located inside a parking structure — in December 2017. 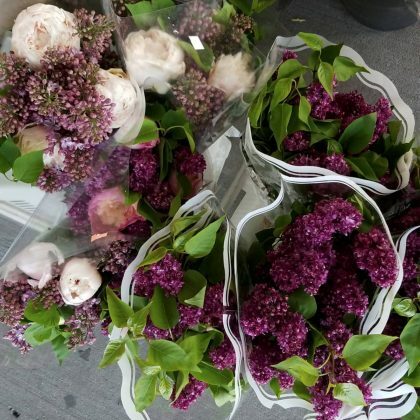 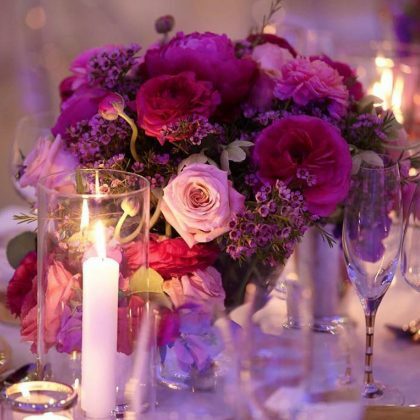 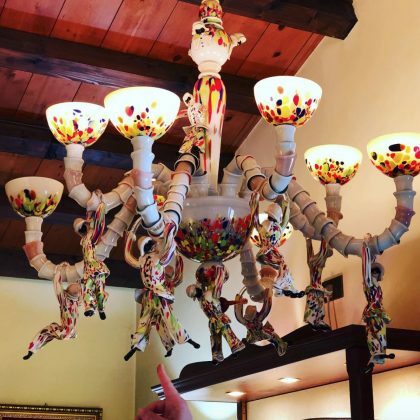 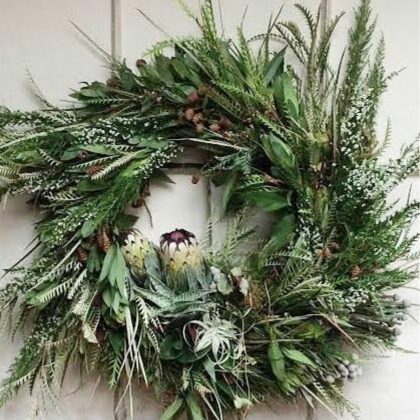 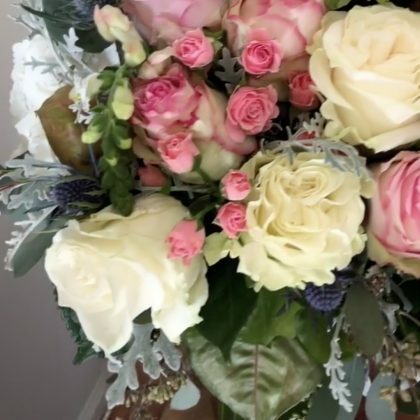 Alicia Silverstone gave a shoutout to San Francisco, CA floral designer Lila B. 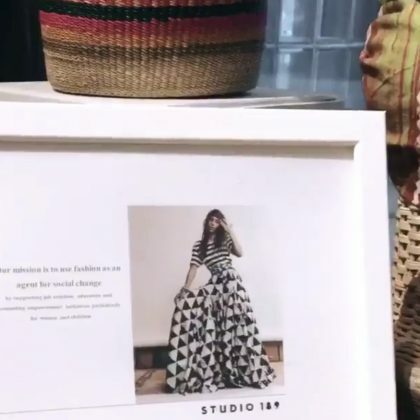 Design in December 2017. 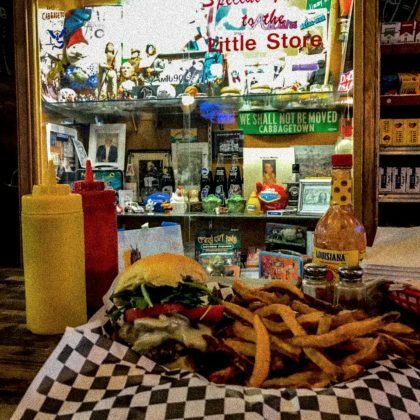 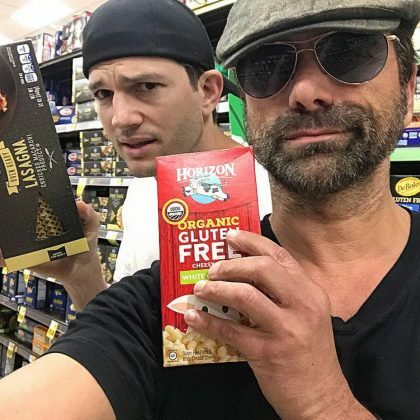 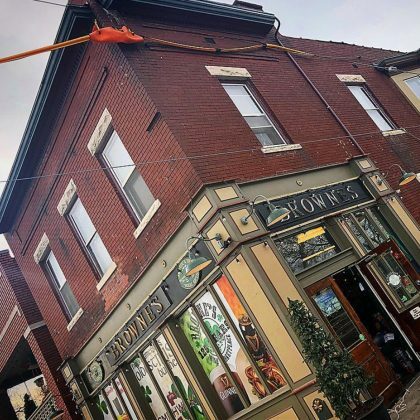 In December 2017, Stephen Moyer shared, “There are many things I will miss about Atlanta, but right up there, very near the top, is the life changing burger at” Little’s Food Store. 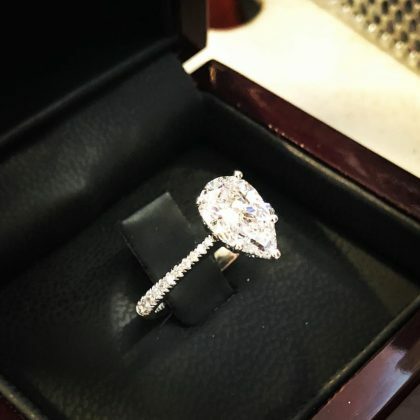 Rosie Huntington-Whiteley said she was “Playing dress in the prettiest jewellery box in Manhattan” — NIRAV MODI, New York — in December 2017. 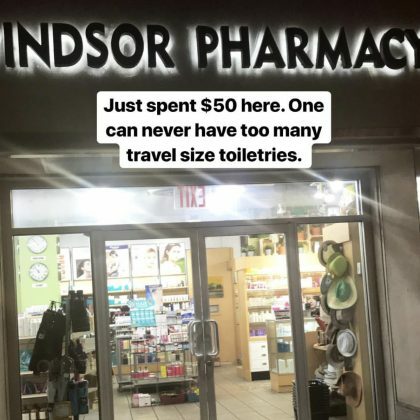 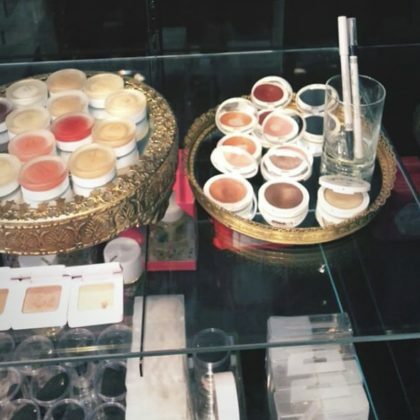 Gwen Stefani stopped by a perfumery at Villa 515 in December 2017. 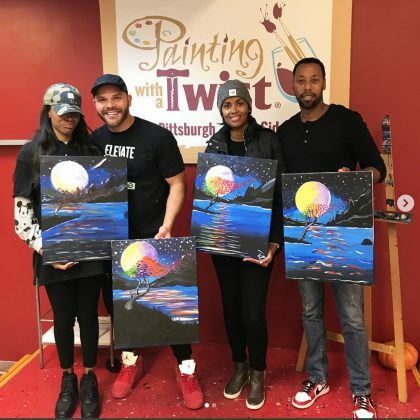 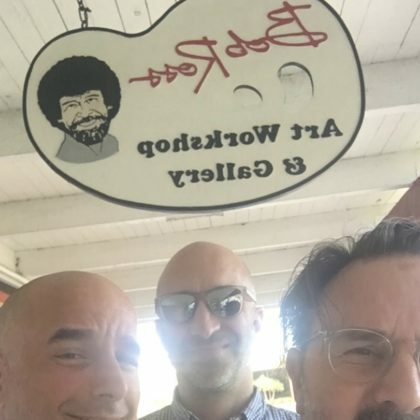 David Arquette participated in a landscape painting seminar at Bob Ross Art Workshop in December 2017. 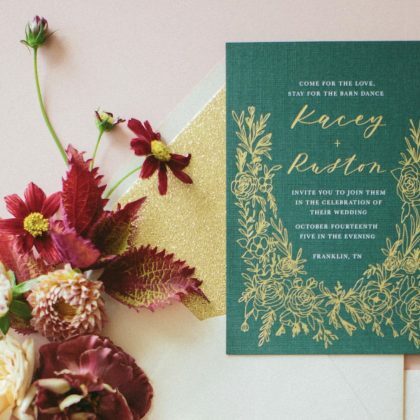 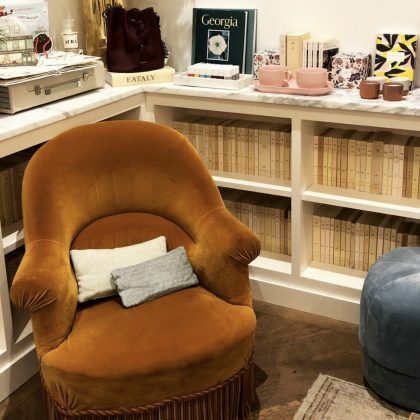 Catherine Giudici stopped by Talulah Belle Dallas in November 2017 to share her excitement for the fact that her greeting cards were on sale there. 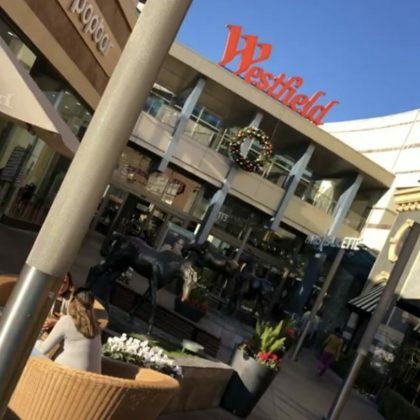 Heidi Pratt and Spencer Pratt strolled around Santa Monica Place with their son Gunner Pratt in November 2017. 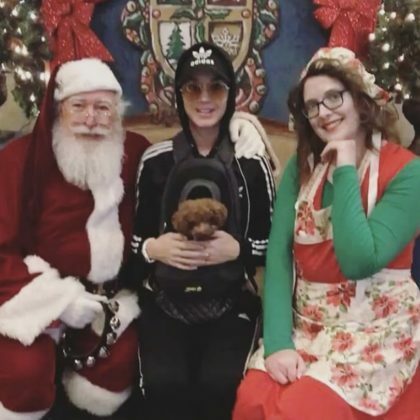 Katy Perry said, “just ran into this guy,” when she sat with Santa at the seasonal Denver Christkindl Market in November 2017. 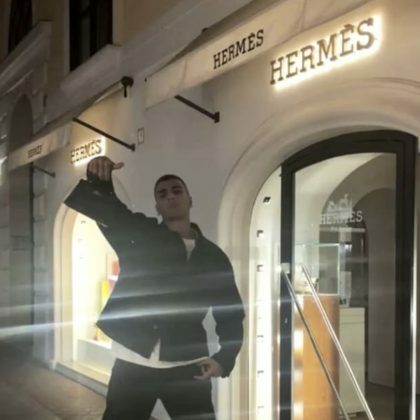 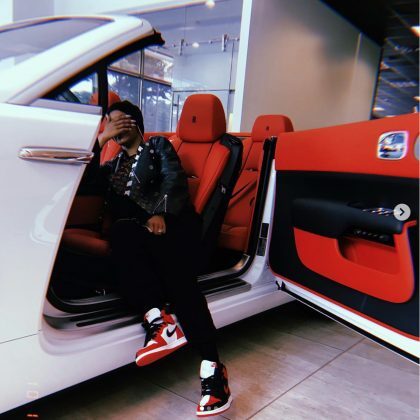 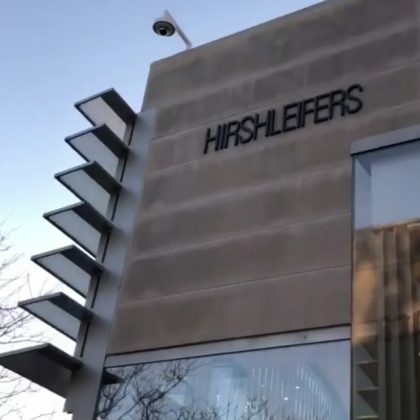 Jonathan Cheban checked into Hirshleifers shoe store in November 2017. 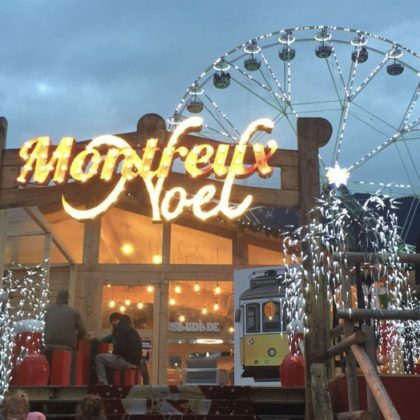 “‘Tis the Season!” is what Daniel Dae Kim said when he stopped by the Marché de Noël à Montreux Christmas market in November 2017. 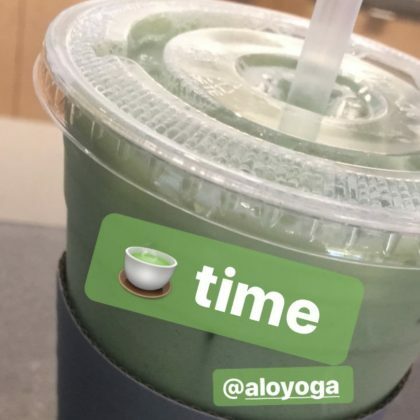 It was “[matcha] time” for Camilla Belle when she was back at All Yoga in November 2017. 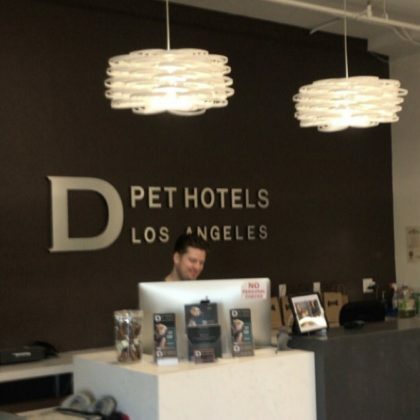 Holly Robinson Peete thanked D Pet Hotels Los Angeles in November 2017. 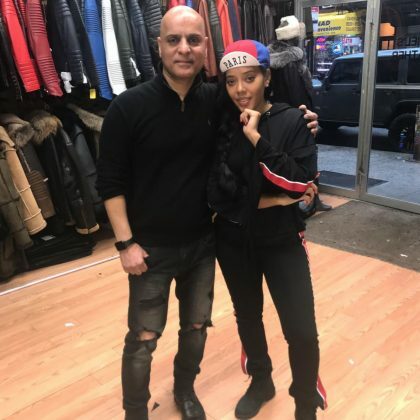 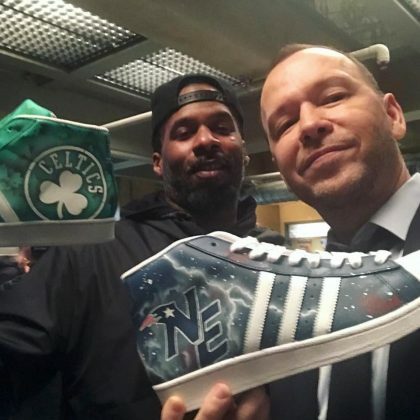 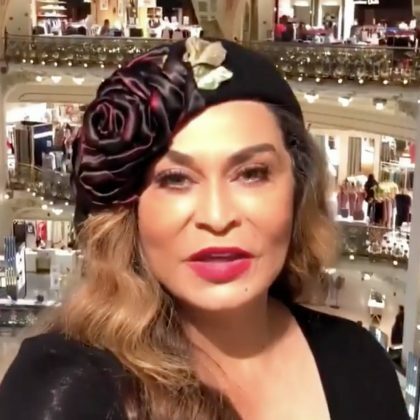 Faith Evans thanked MULA “for the dope kicks” she picked up when she shopped here in November 2017. 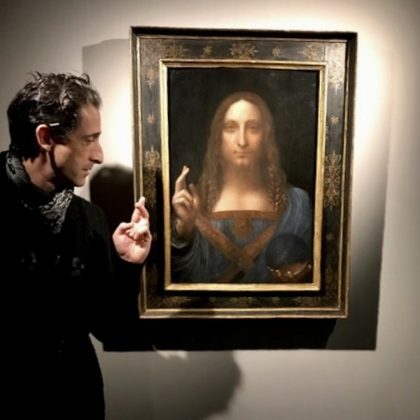 Adrien Brody congratulated Christie’s in November 2017 “for the record breaking sale” of what’s known as The Last da Vinci. 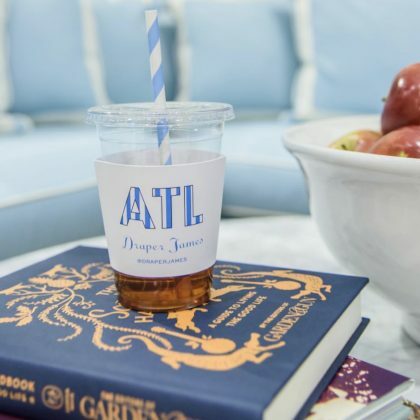 In November 2017, Reese Witherspoon was excited to share that she just opened Draper James, Atlanta. 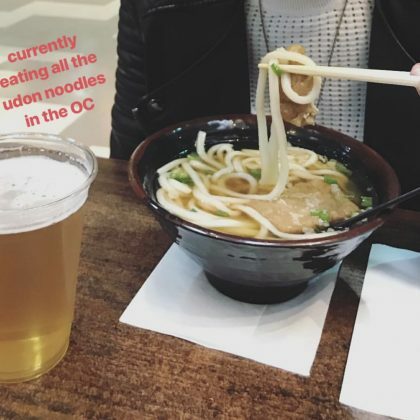 Kate Hudson sat outside Santa Monica, Harajuku in November 2017 an said it was “A familiar surrounding” while in Tokyo. 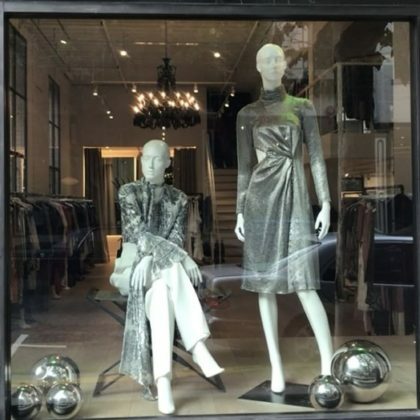 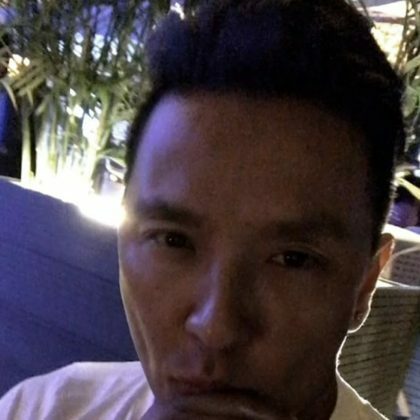 “Our girls look Lovely” is what designer Prabal Gurung said about the PIA mannequins wearing his clothing in November 2017. 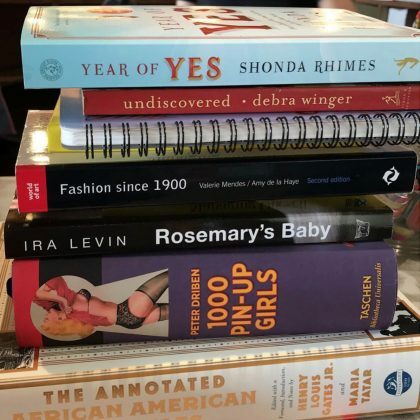 Karrueche Tran picked up a pile of “New new” books at Samuel French Theatre and Film Bookshop in November 2017. 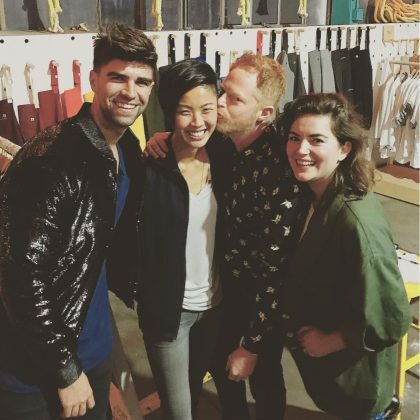 Jesse Tyler Ferguson and Justin Mikita attended a friend’s cookbook release party at Hedley & Bennett in November 2017. 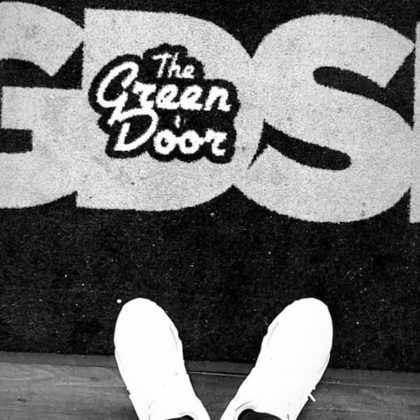 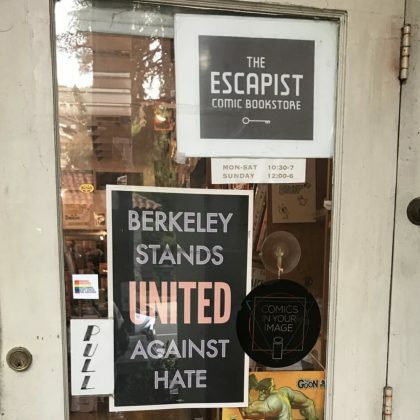 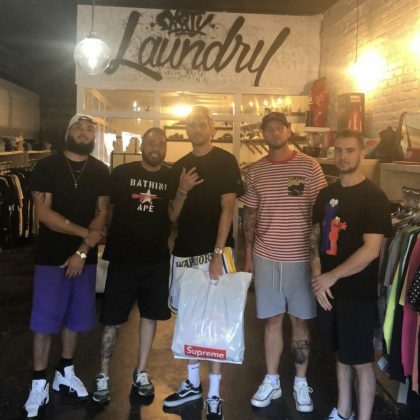 G-Eazy stopped by The Escapist Comic Bookstore in November 2017. 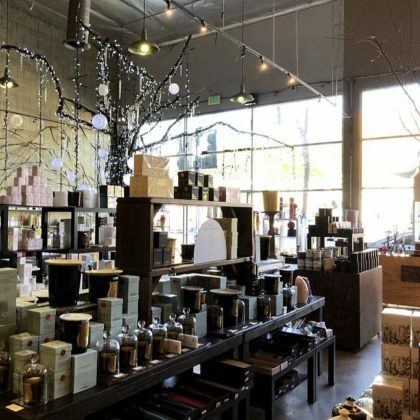 Michael Polish browsed the goods at Best Made Company in November 2017. 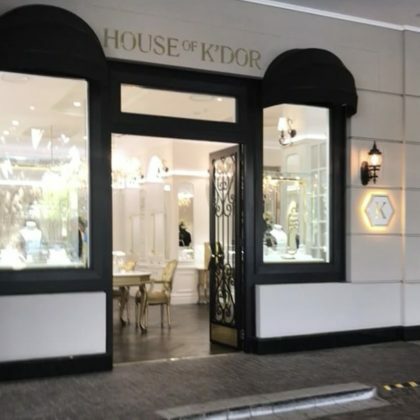 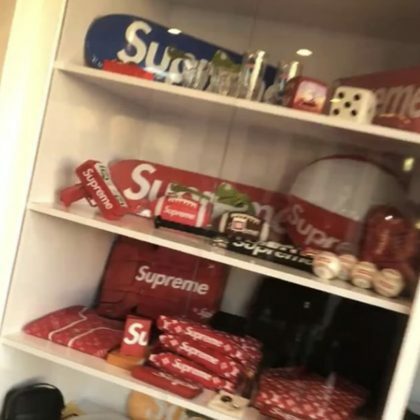 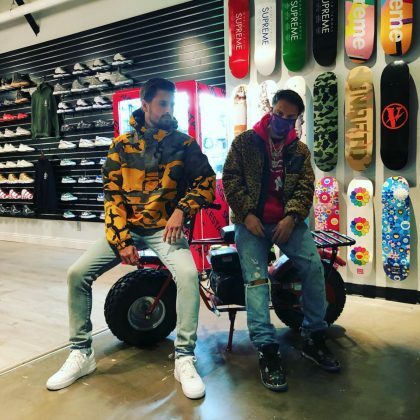 Scott Disick went shopping “at this new spot we found” — SoleStage, Alhambra — in November 2017. 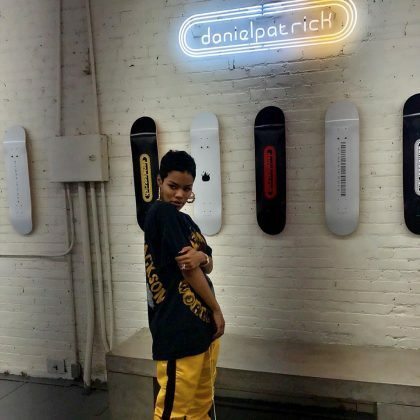 Teyana Taylor said she “Pulled up on my boy @danielpatrick_ cave to pick up some new heat” when she shopped at Daniel Patrick, Los Angeles in November 2017. 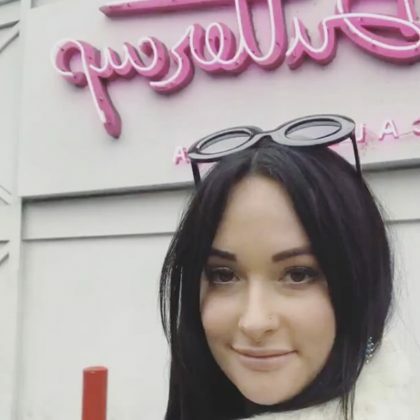 Kacey Musgraves snapped a selfie in front of HD Buttercup, DTLA’s neon sign in November 2017. 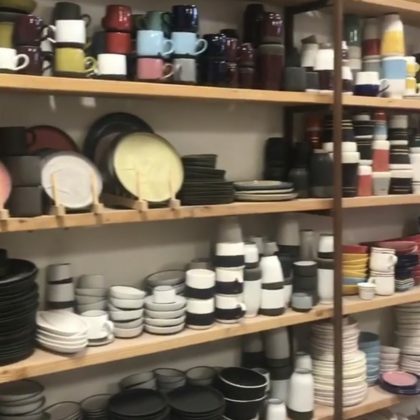 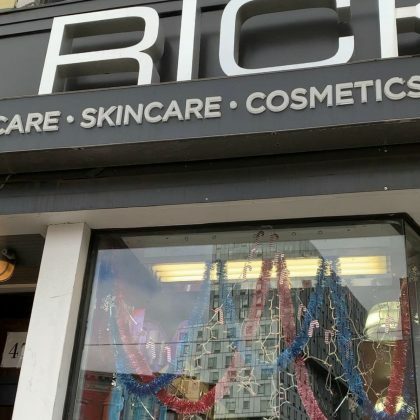 Tiffani Thiessen shopped the shelves of Robert Siegel Studio in November 2017. 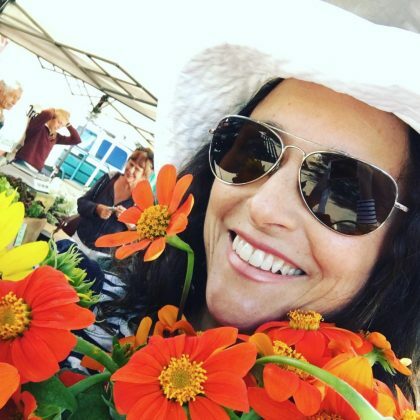 O-Town’s Erik Estrada looked at food and flowers when he hit up the Beverly Hills Farmers’ Market in October 2017. 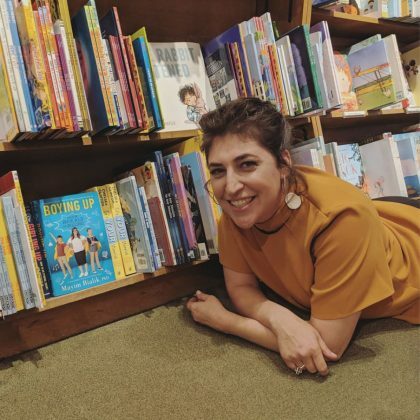 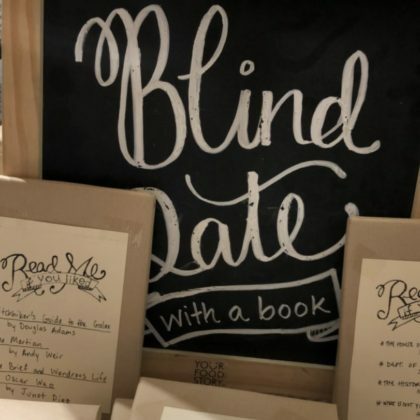 Jenna Ushkowitz browsed the “Blind Date with a book” section of Book Culture on Columbus in October 2017. 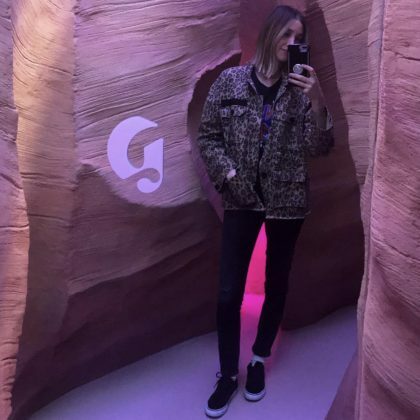 Whitney Port shopped at the “Too cool” LCD, Downtown LA in October 2017. 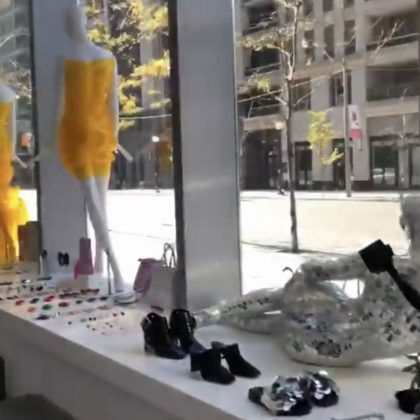 Whitney Port shopped at several stores inside the ROW DTLA in October 2017. 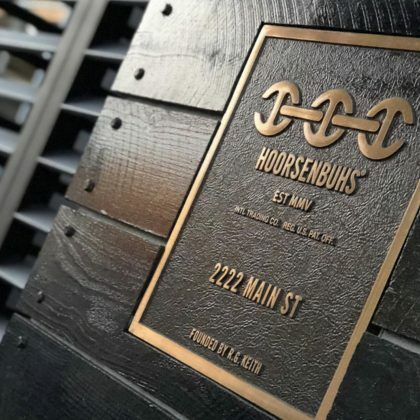 David Beckham dropped by the HOORSENBUHS jewelry store in October 2017. 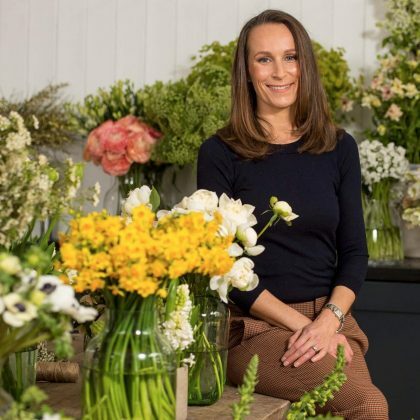 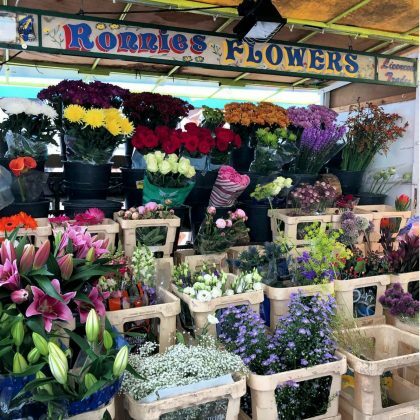 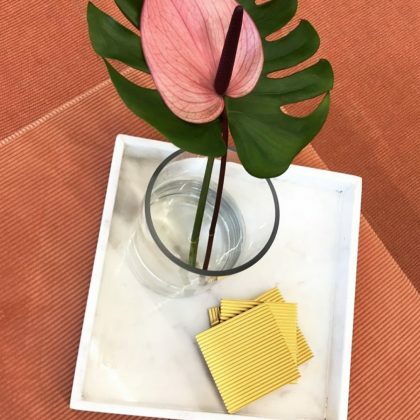 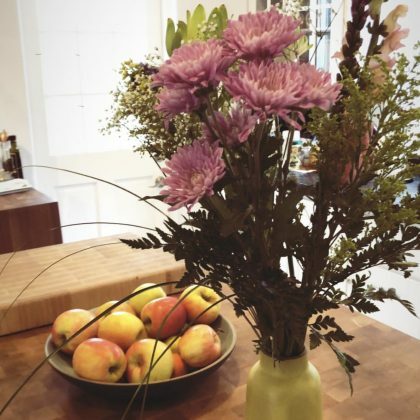 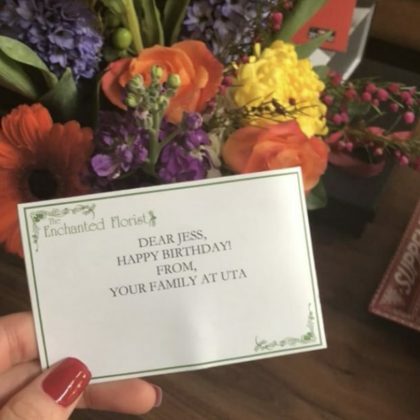 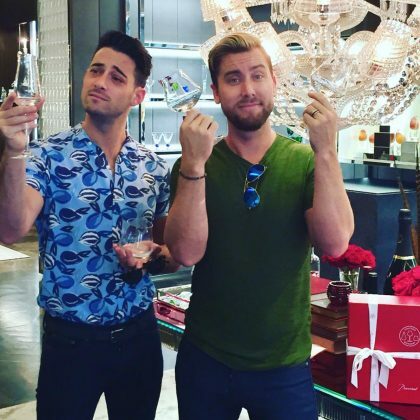 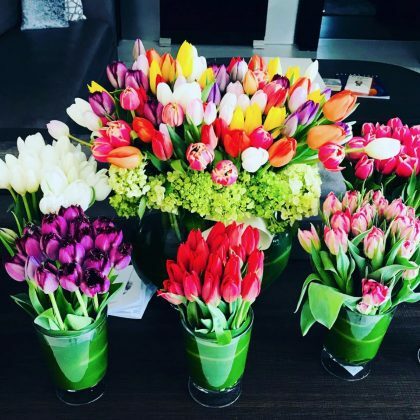 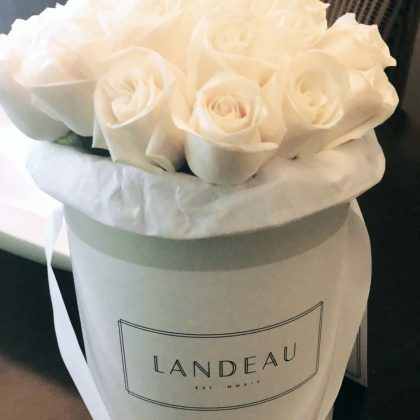 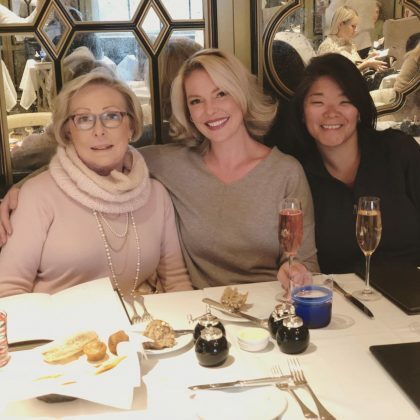 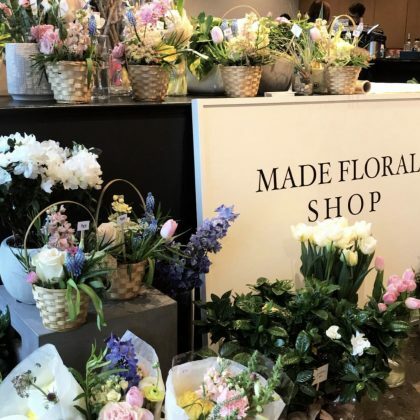 Stephanie Pratt thanked a friend for sending her an arrangement from Amanda Austin Flowers in October 2017. 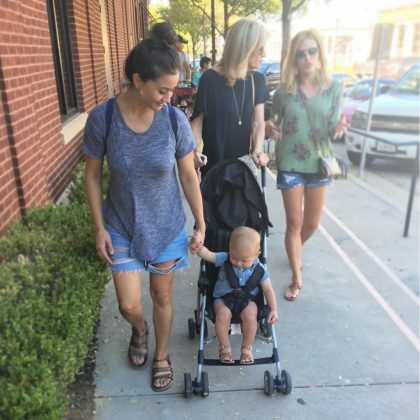 Catherine Giudici strolled around Southlake Town Square with son Samuel Lowe in October 2017. 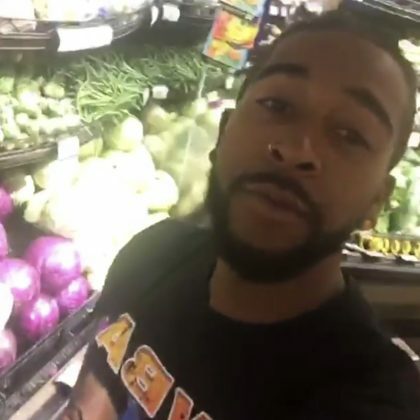 Omarion picked out produce at Ralphs, Wilshire & Hauser in October 2017. 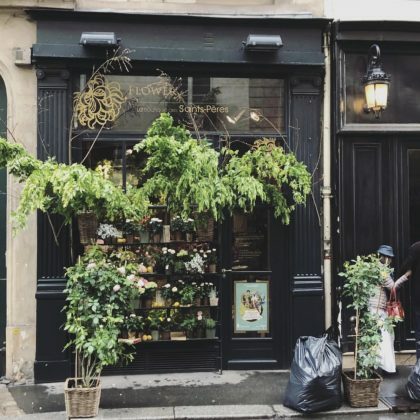 Alessandra Ambrosio did some “Shopping” on this famous French street in October 2017. 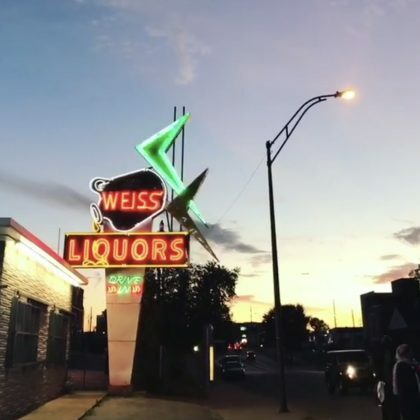 Kacey Musgraves photographed the neon lights at Weiss Liquors in September 2017. 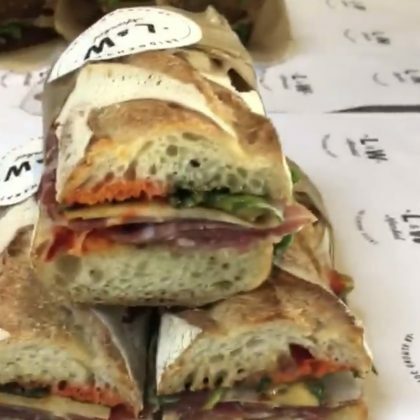 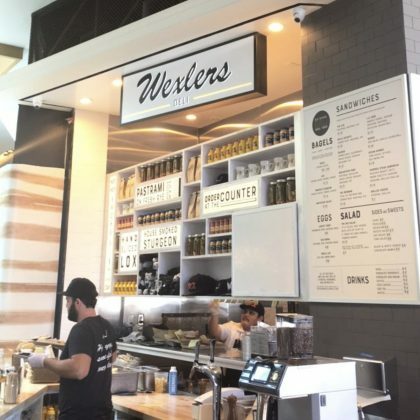 Whitney Port was excited to eat a sandwich and pickles at the Wexler’s Deli inside Westfield Century City in September 2017. 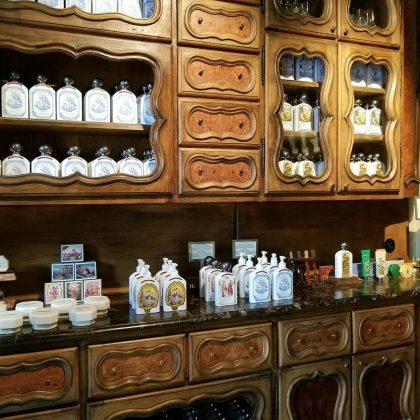 Courtney Love called l’Officine Universelle Buly a “Beautiful classic apothecary in Paris” when she shopped here in September 2017. 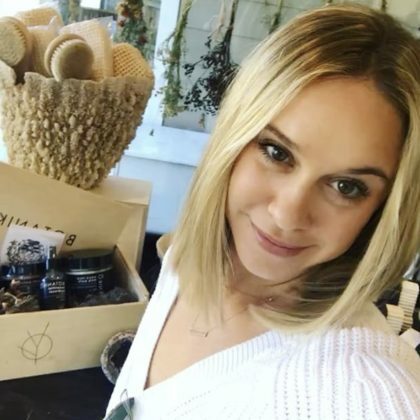 Haylie Duff perused the goods at Midland in September 2017. 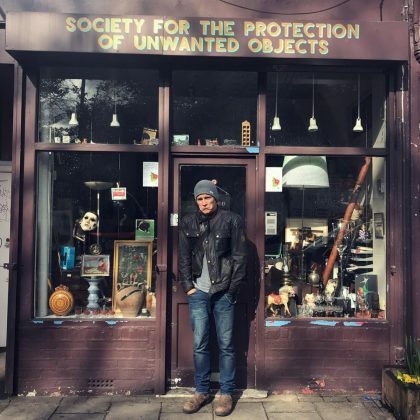 Justin Theroux stopped by Espo’s Art World in September 2017. 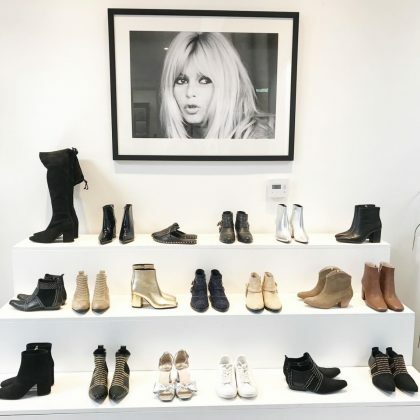 Kelly Rutherford browsed the shoe shelves at ANINE BING in September 2017. 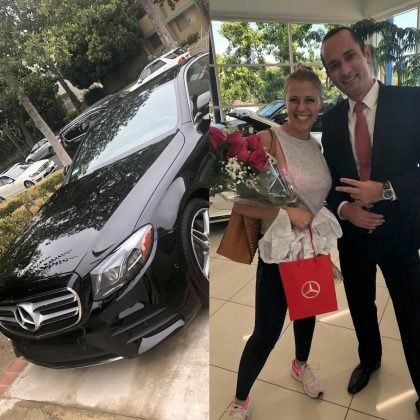 Bridget Marquardt pulled up to Aahs! 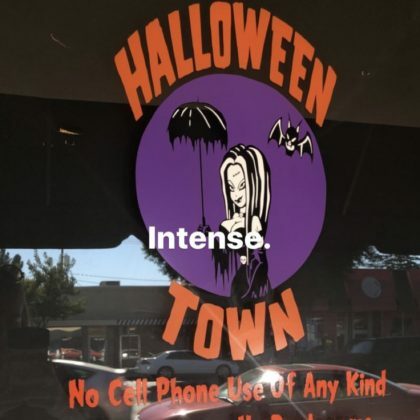 The Ultimate Gift Store, Encino in September 2017 to do some Halloween decoration shopping.